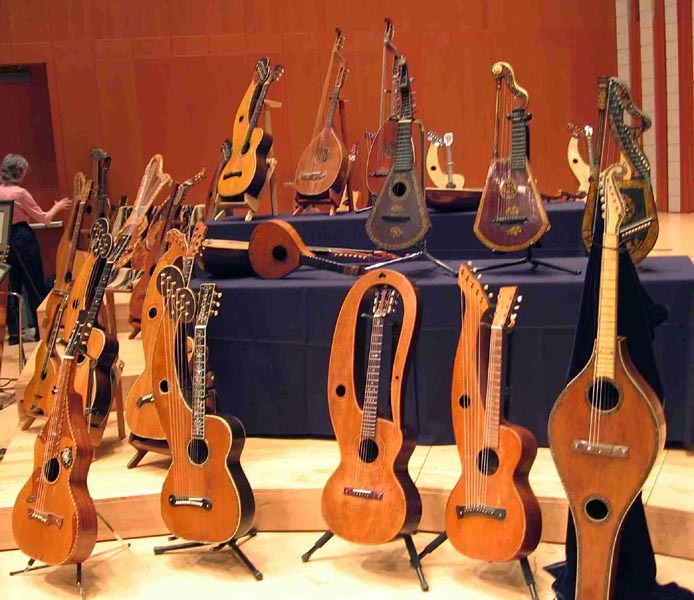 Gregg Miner, noted historian and collector will discuss the history of the instruments on display, and Mike Doolin will give an overview of the latest creations luthiers have presented to players of this remarkable instrument. 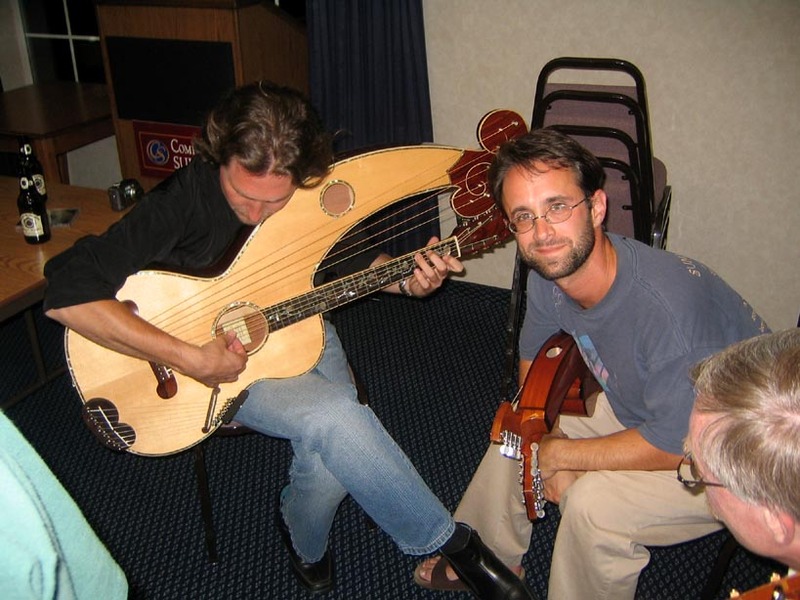 Jeff Elliott and John Doan's harp guitar...where it all began. 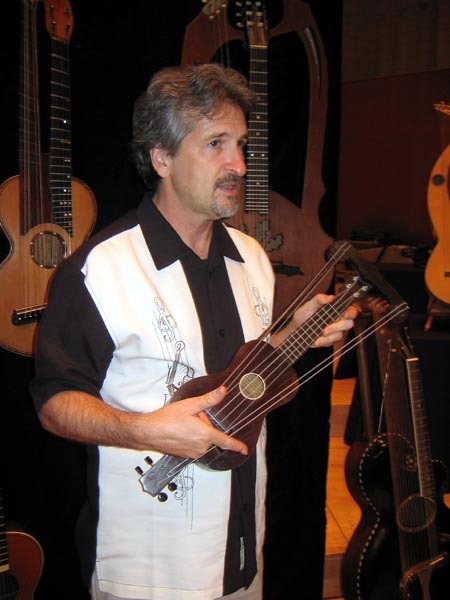 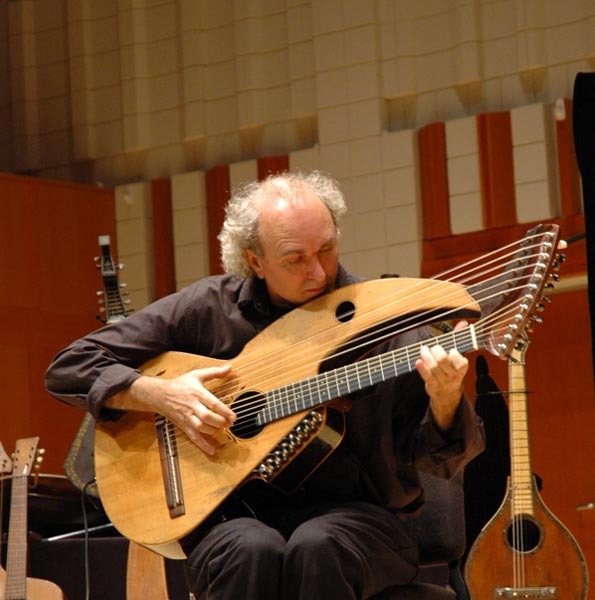 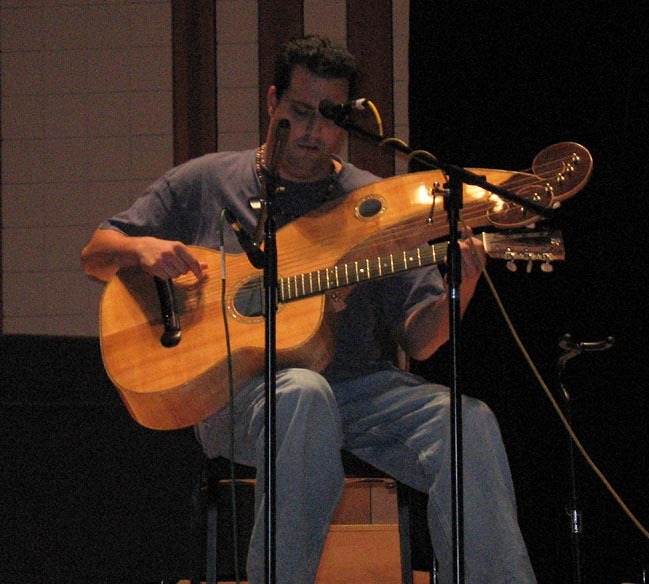 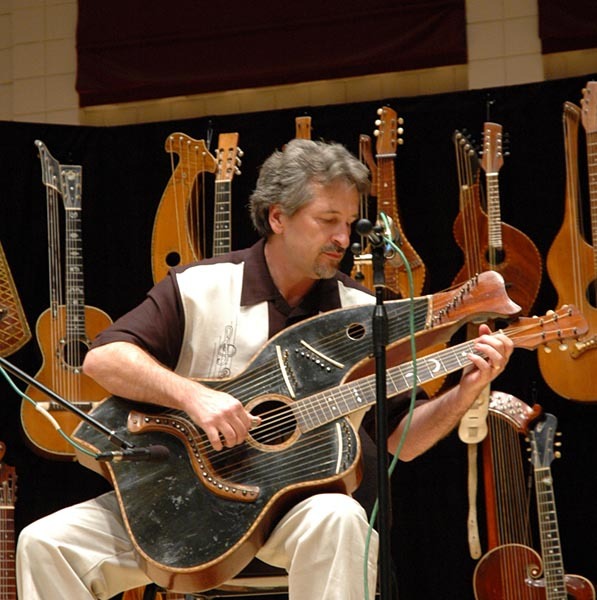 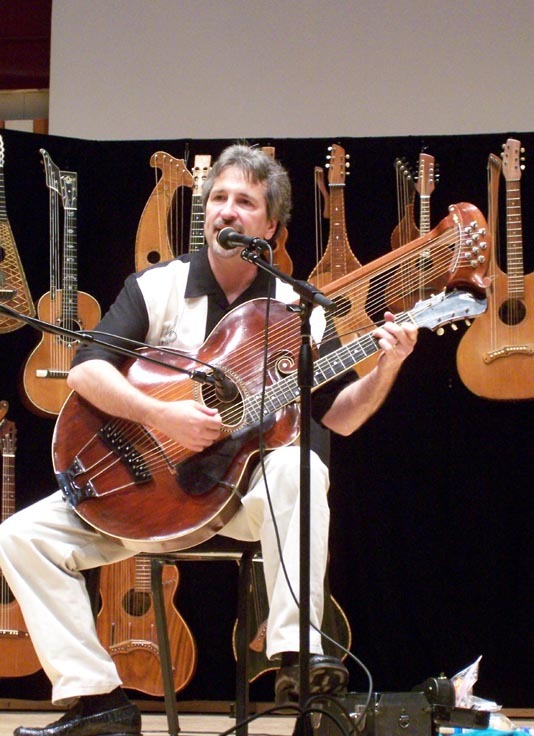 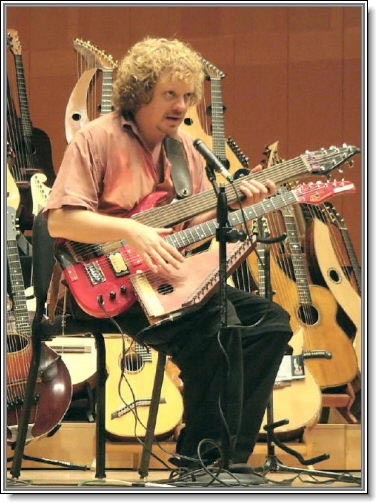 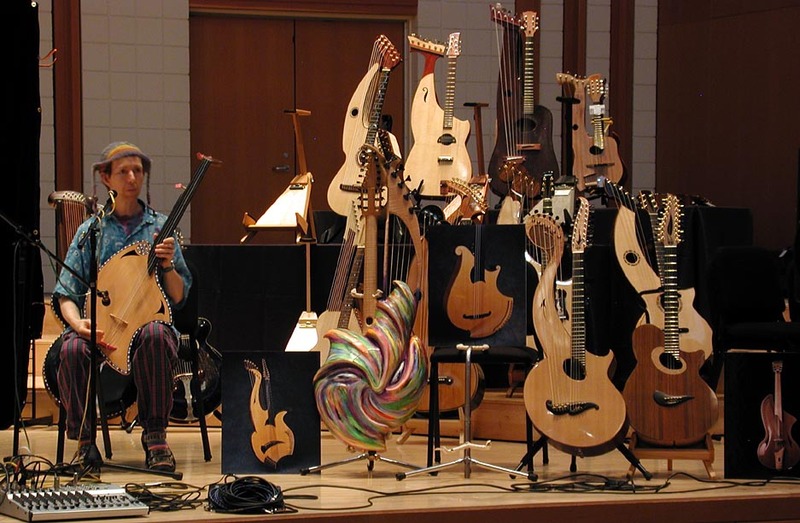 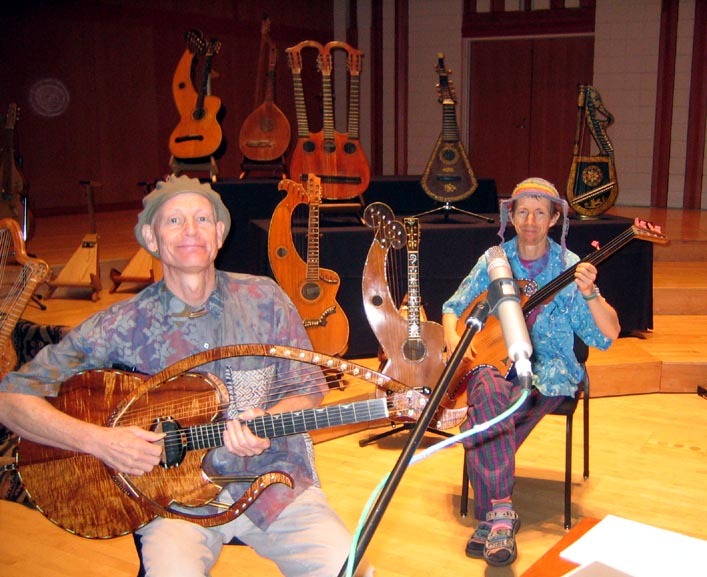 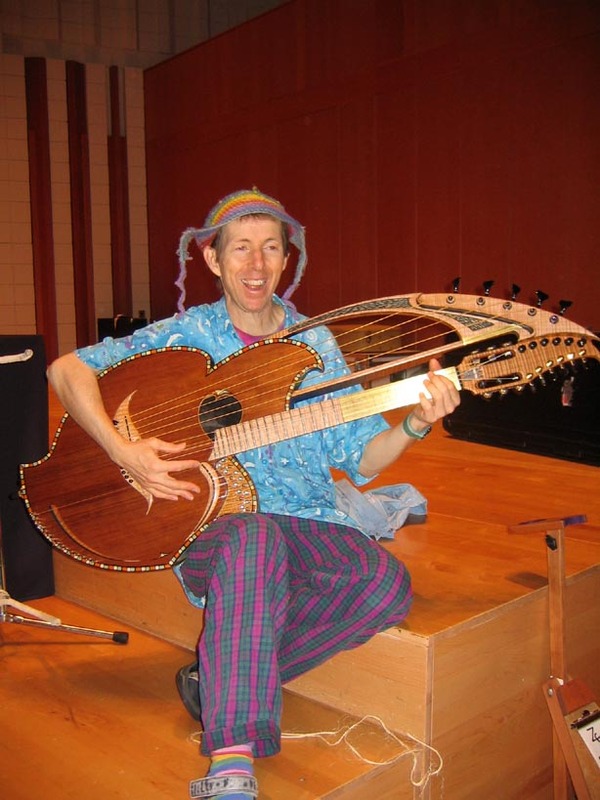 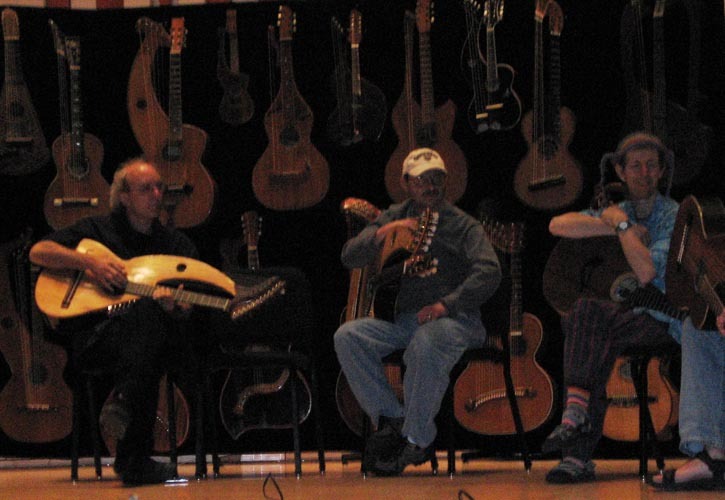 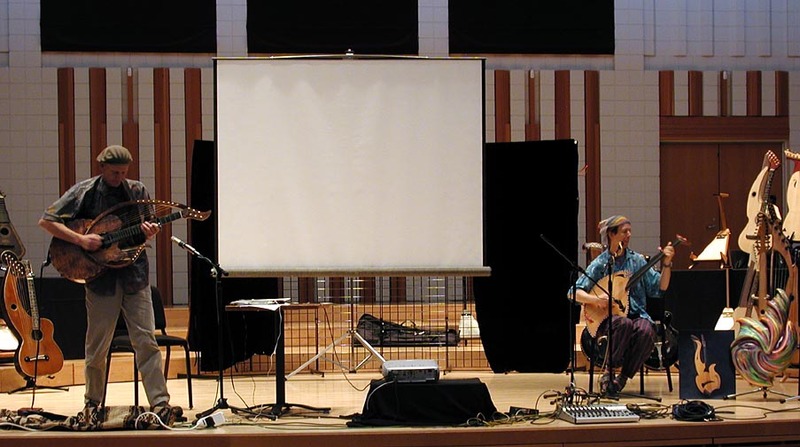 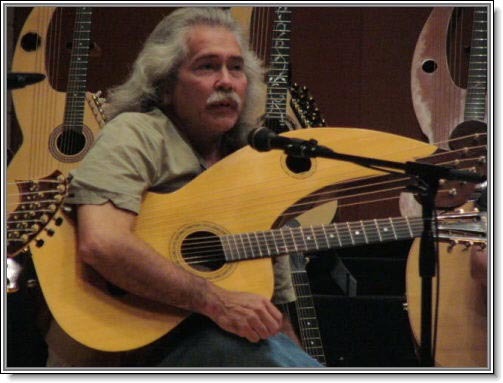 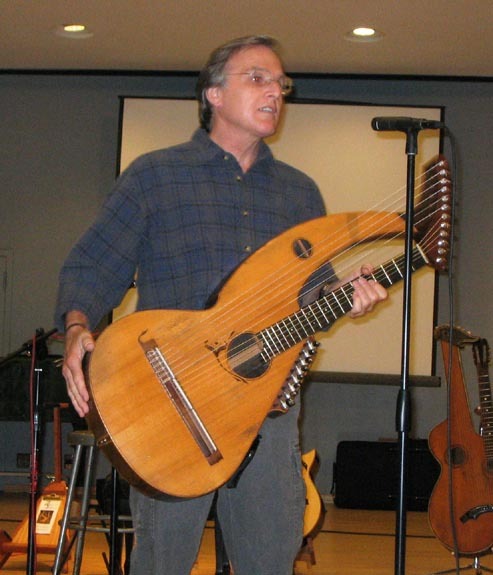 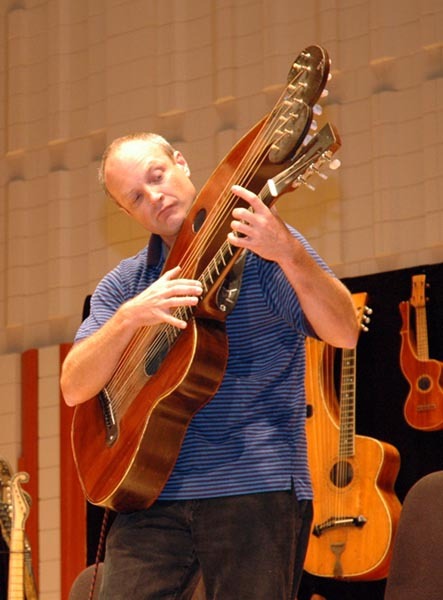 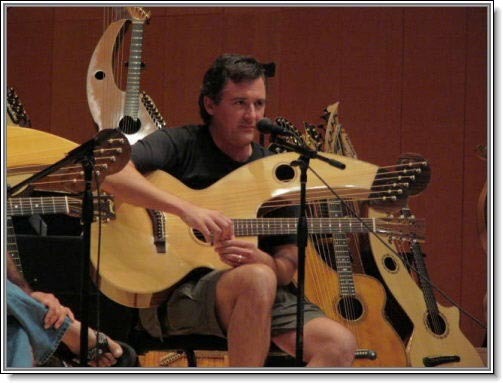 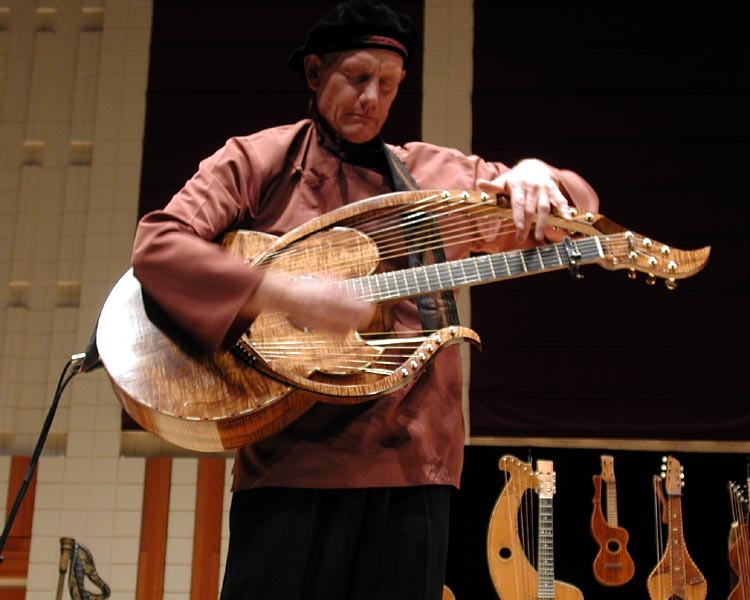 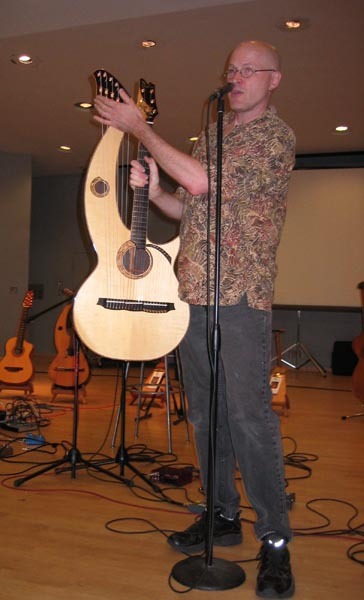 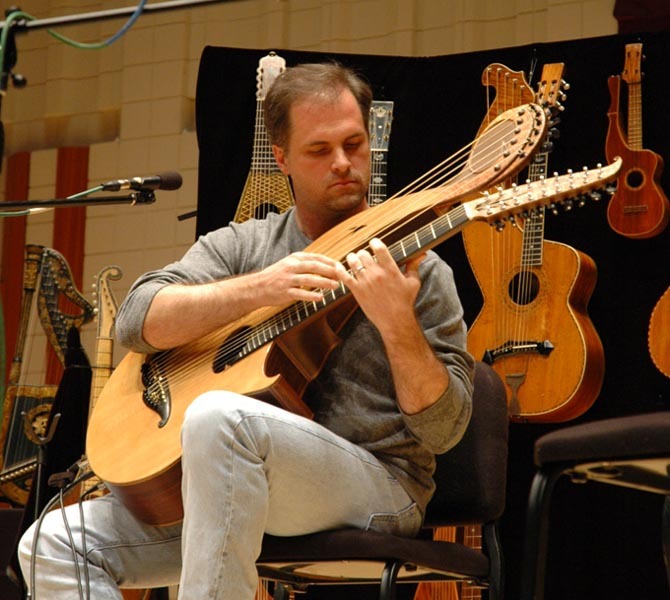 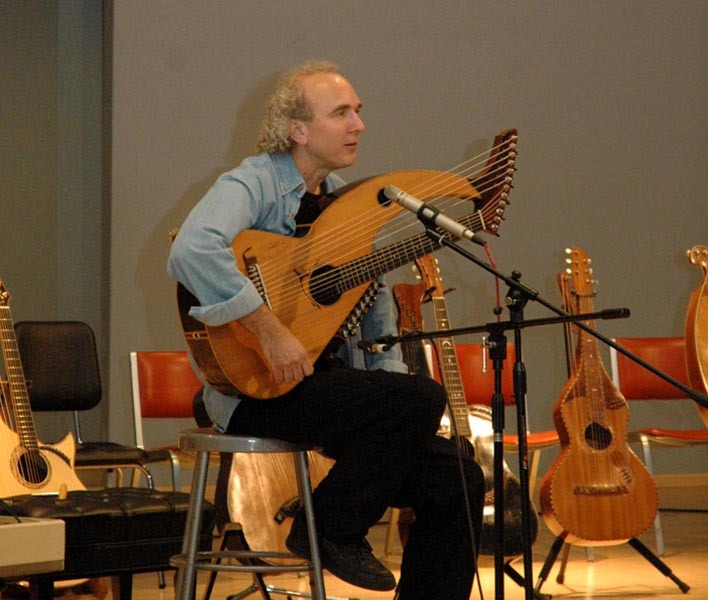 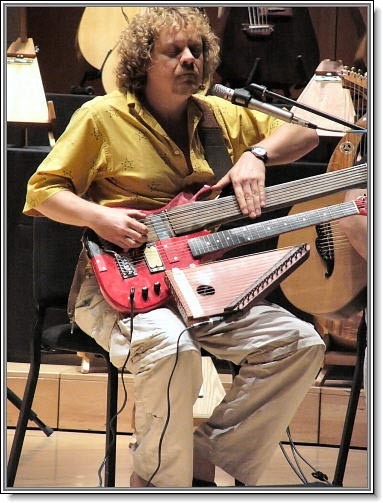 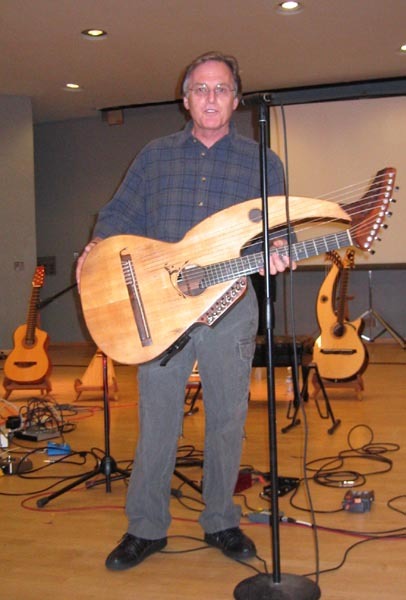 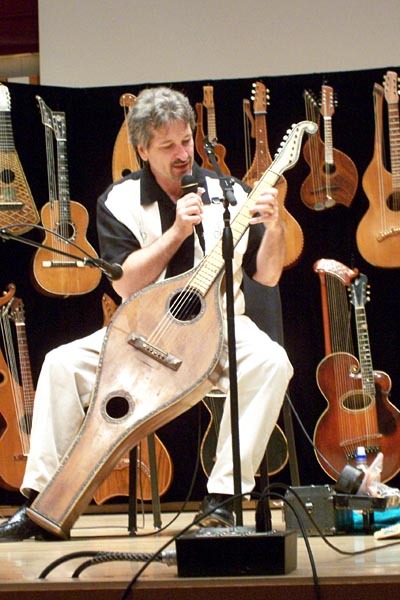 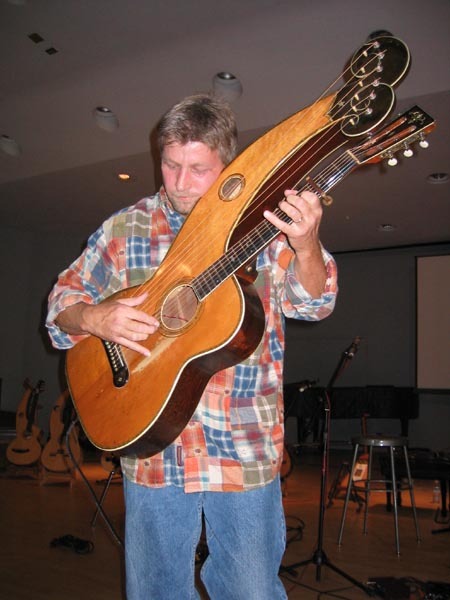 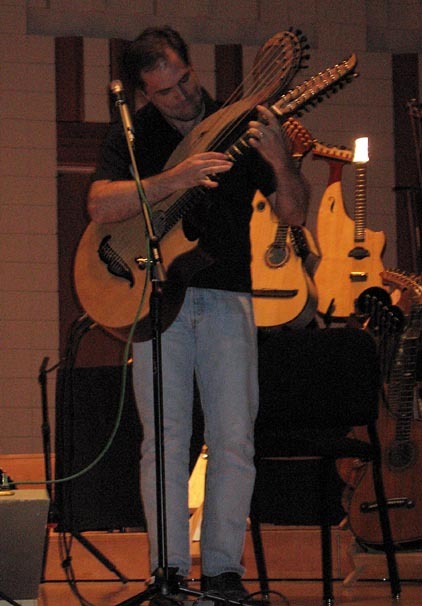 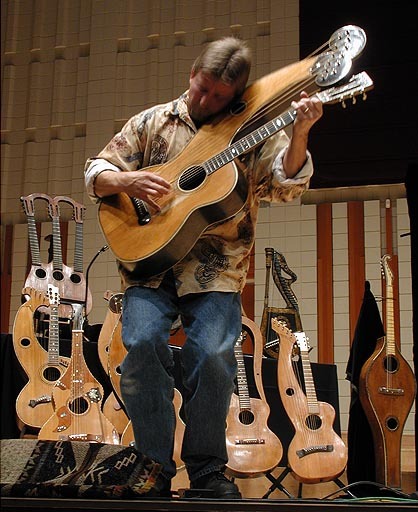 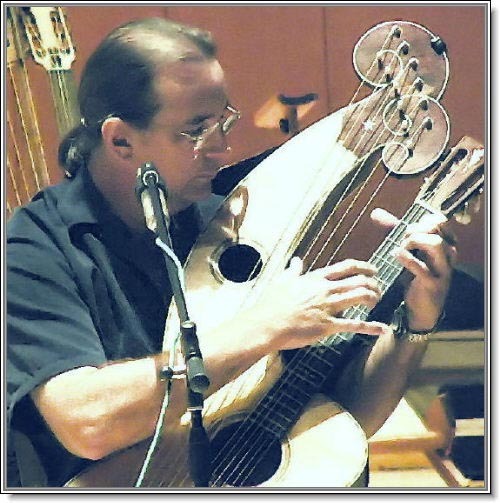 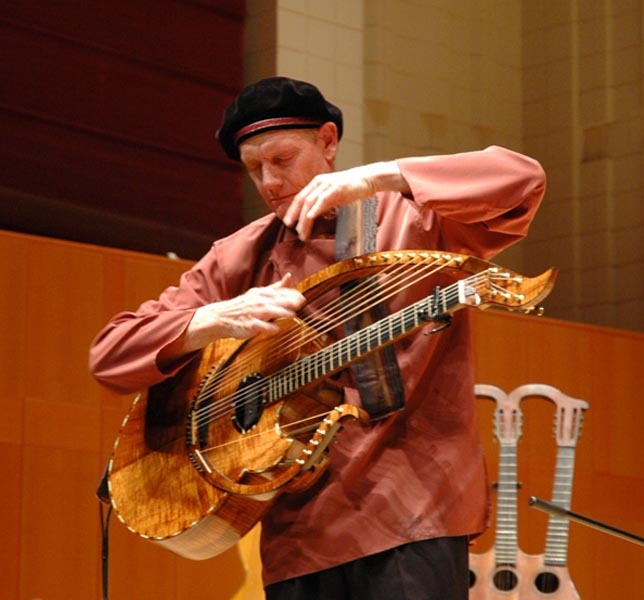 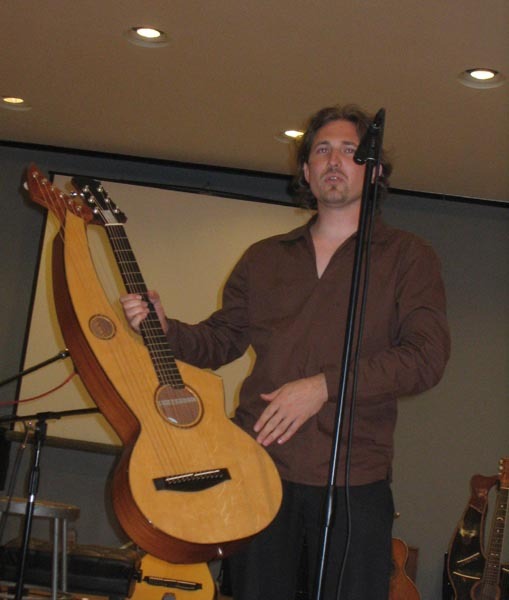 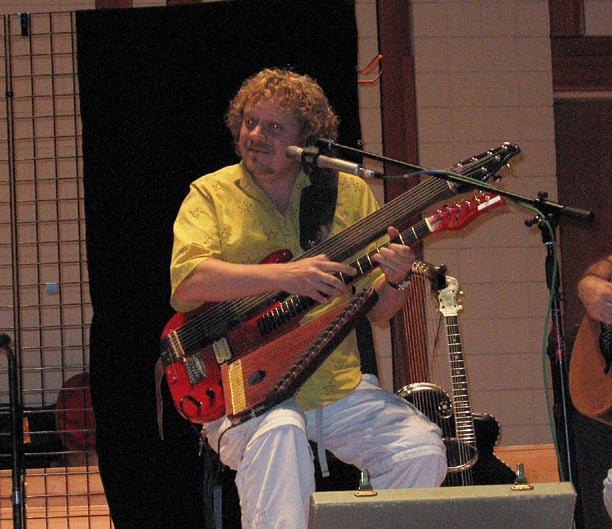 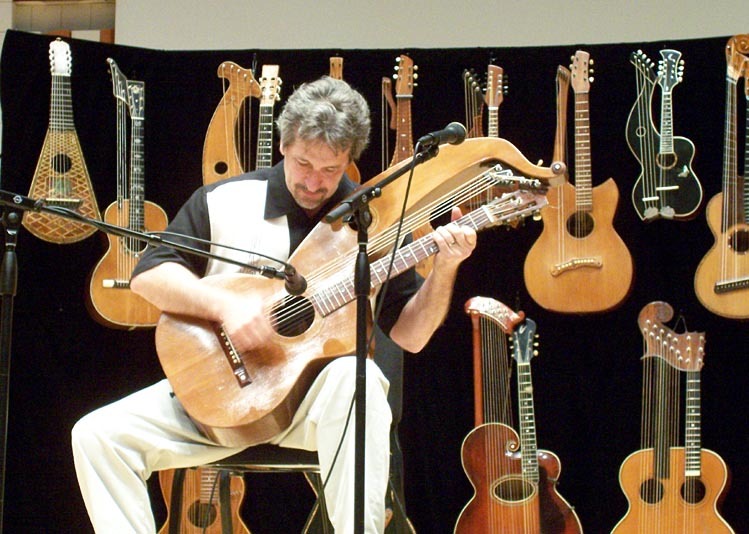 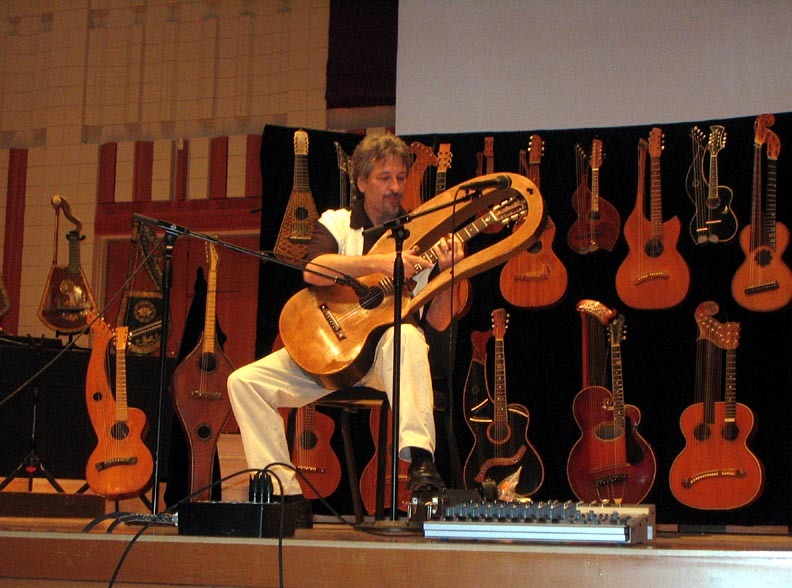 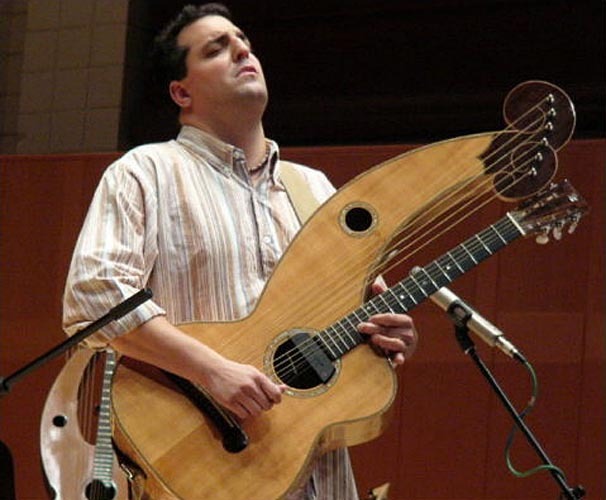 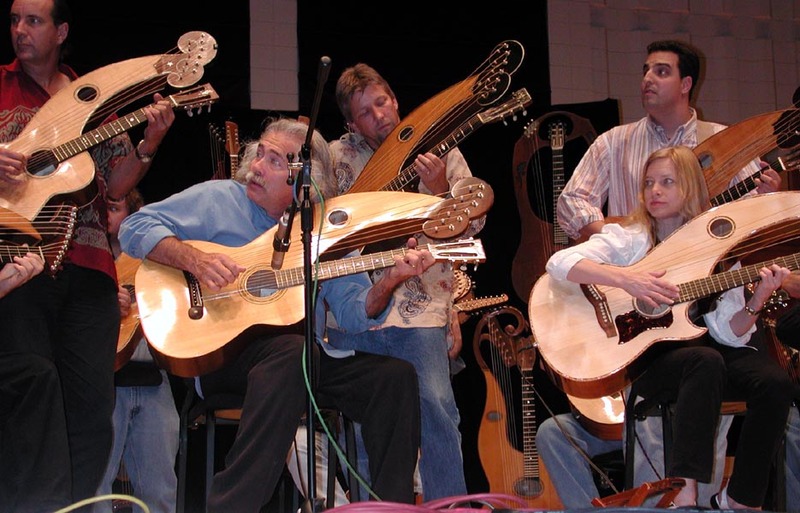 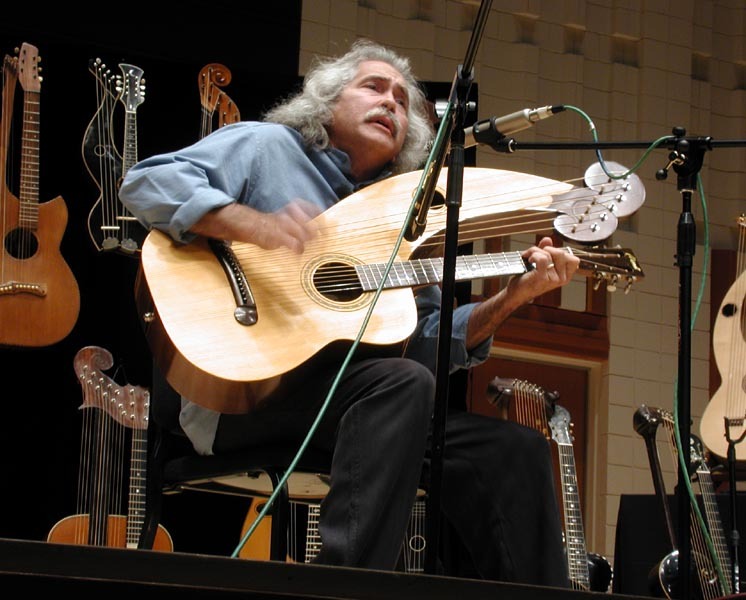 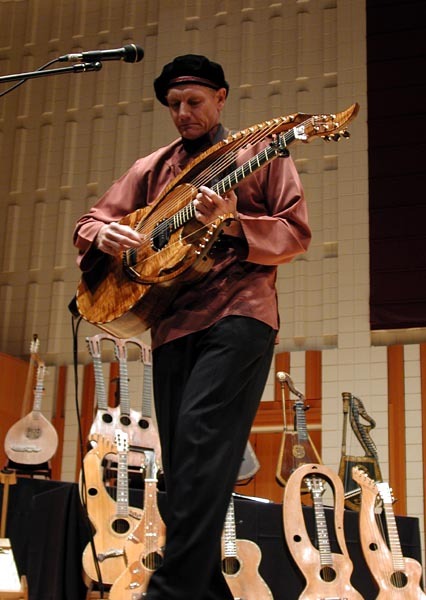 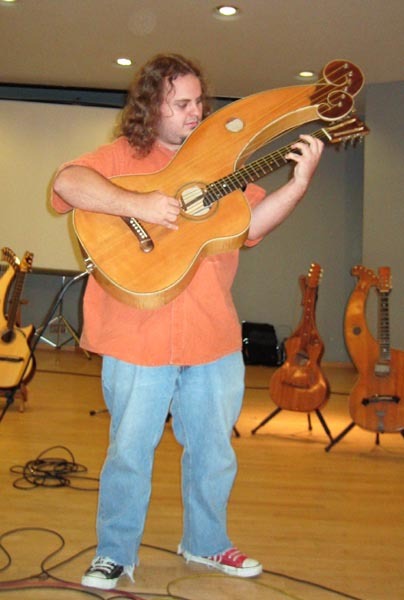 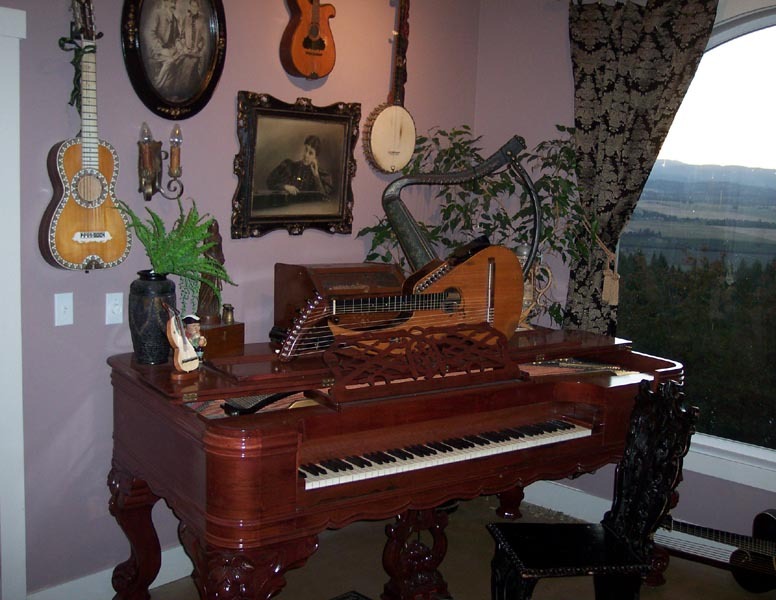 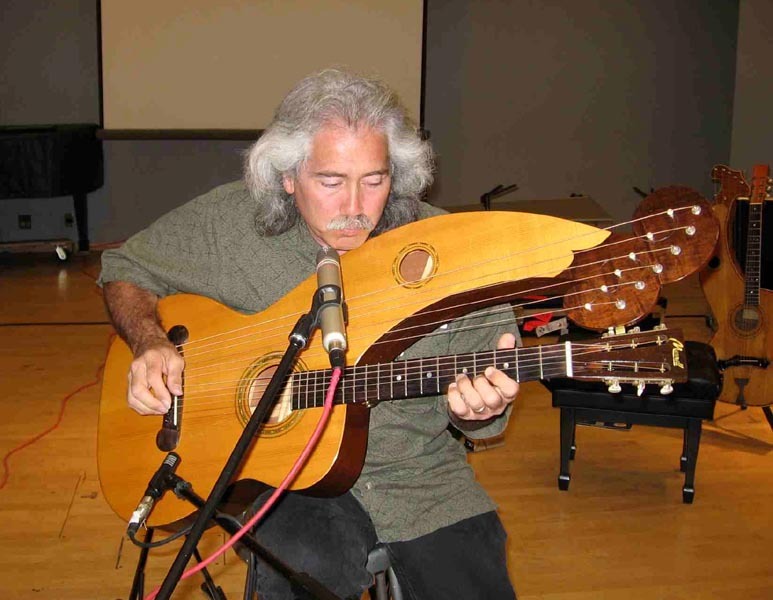 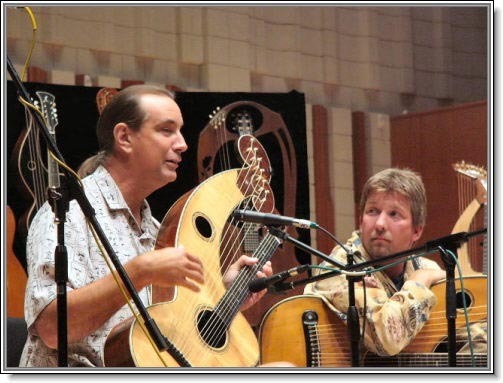 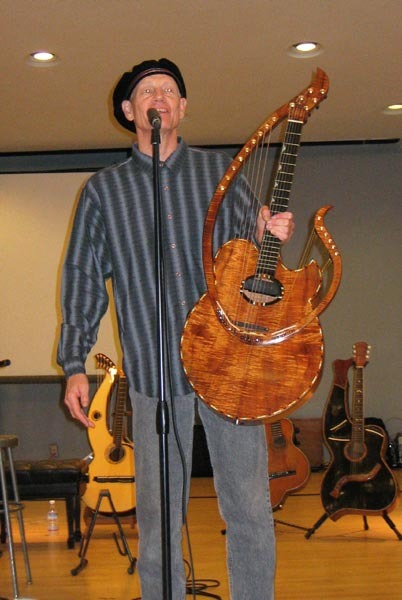 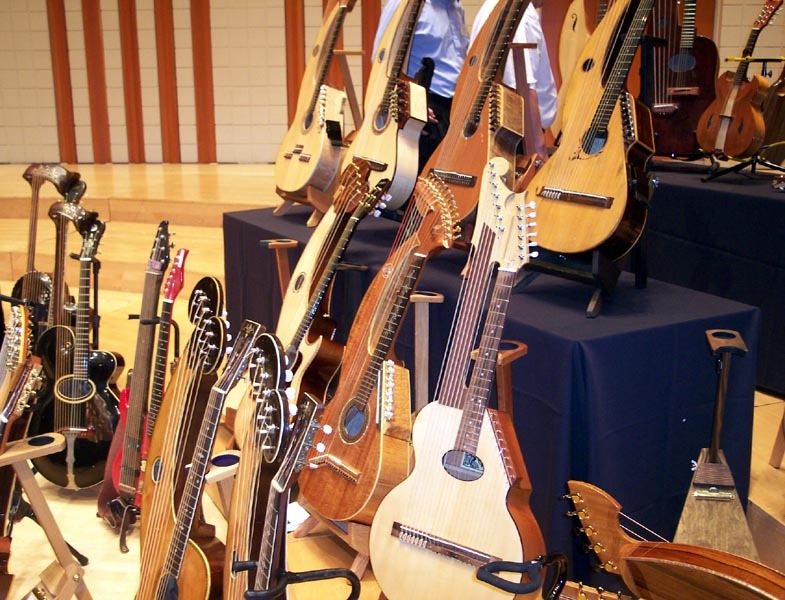 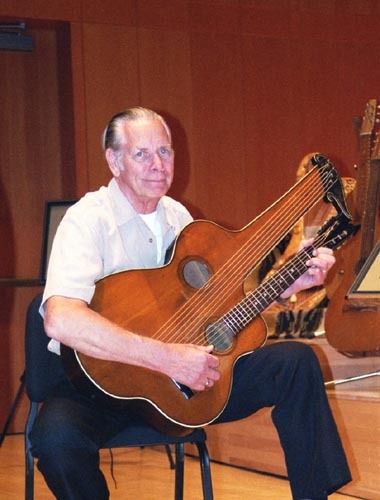 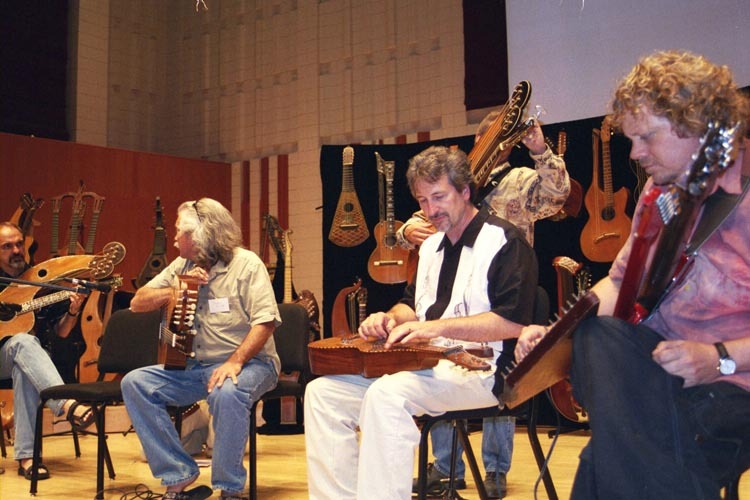 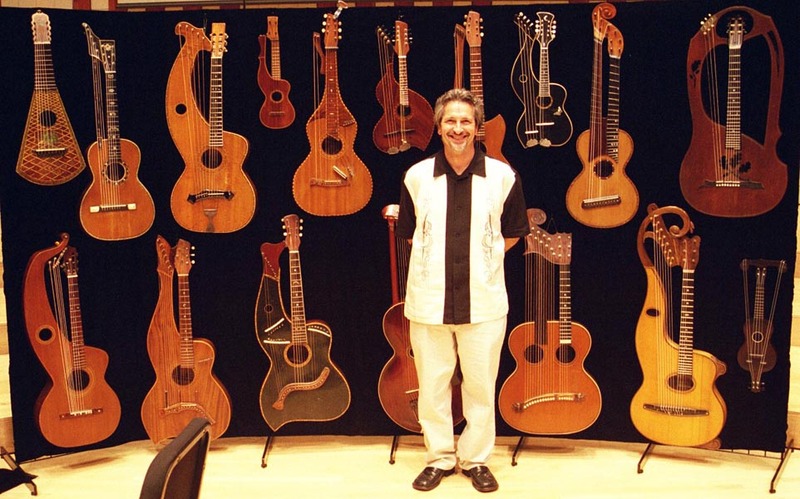 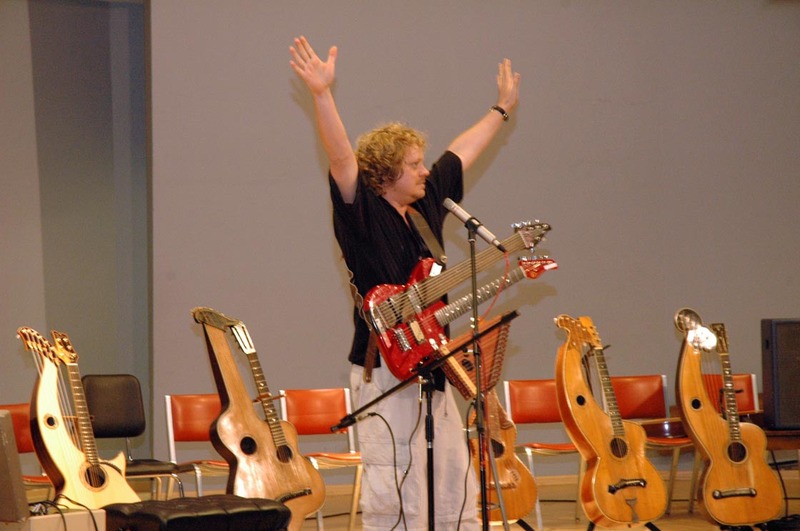 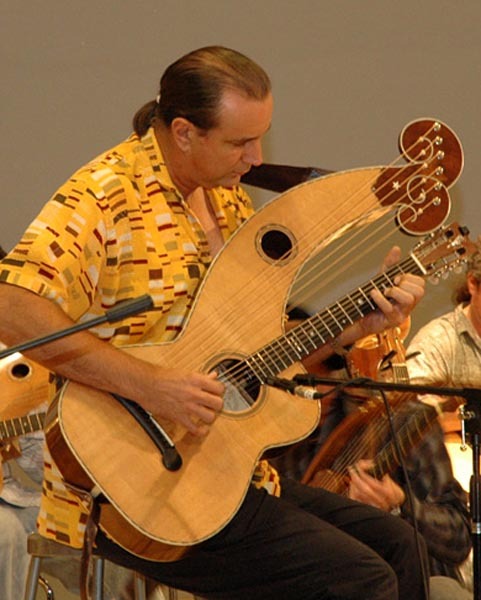 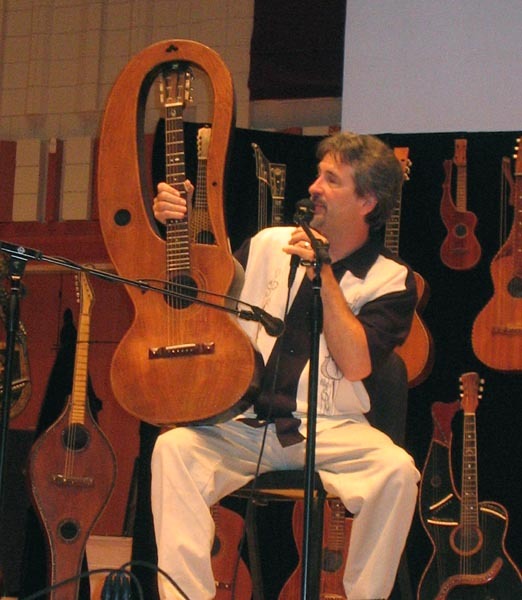 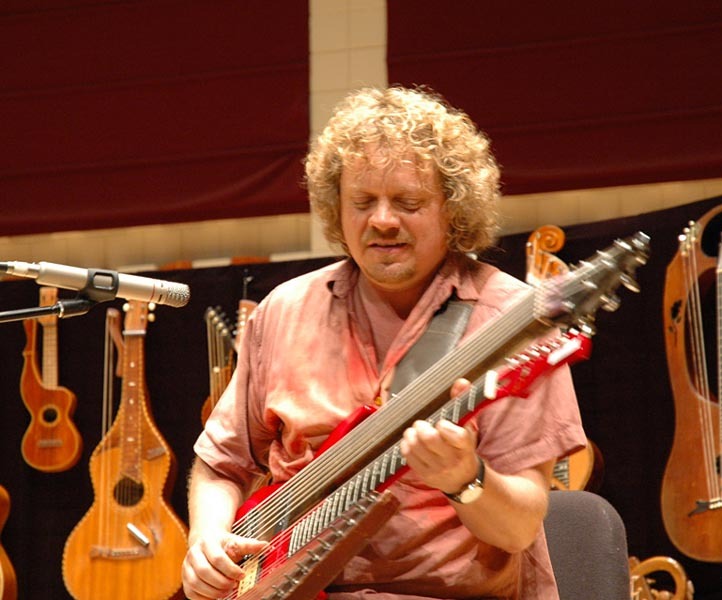 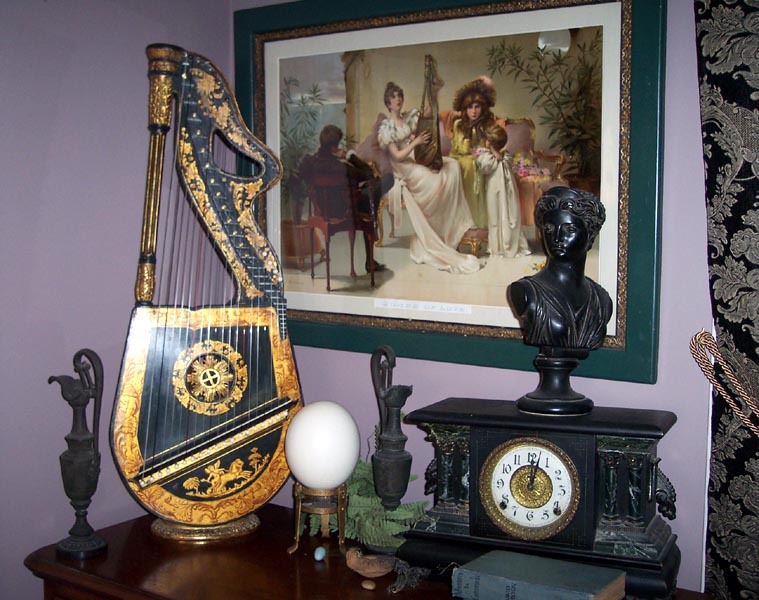 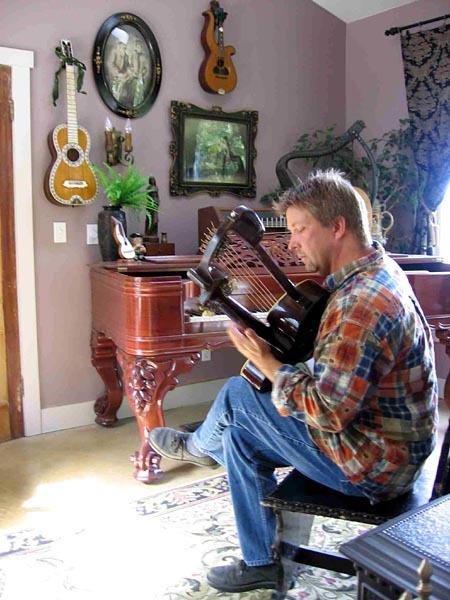 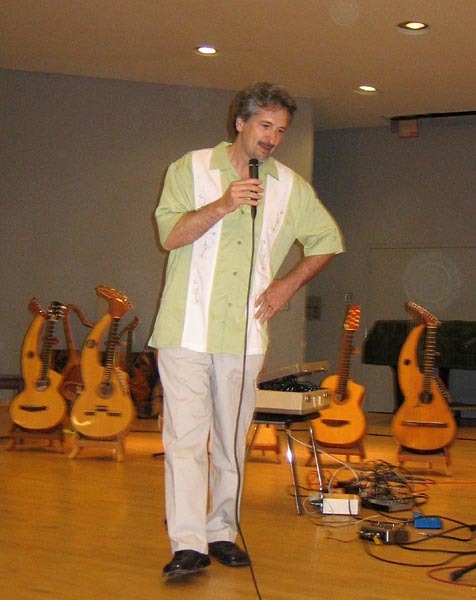 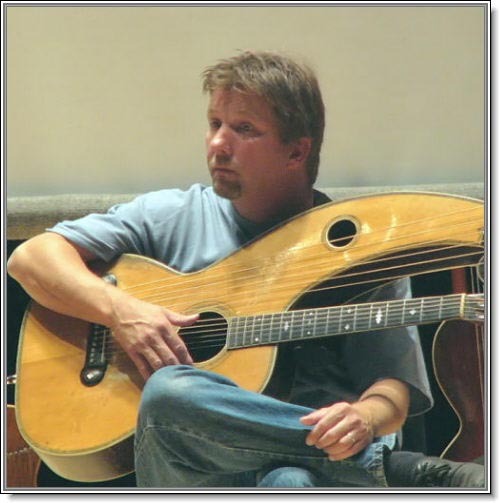 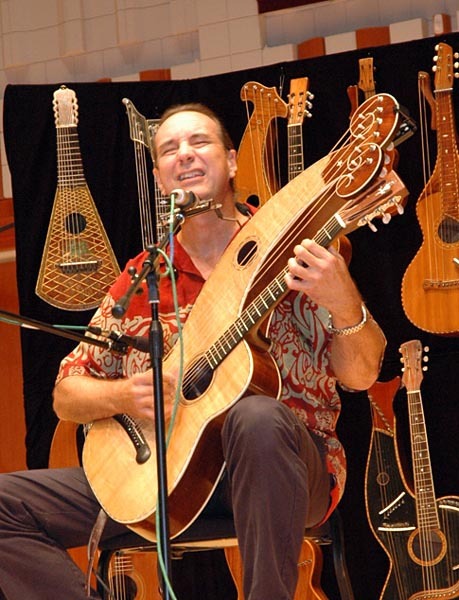 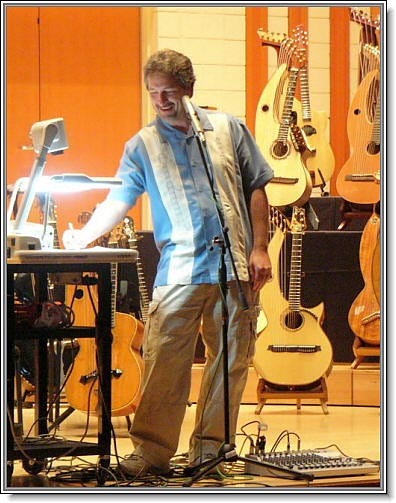 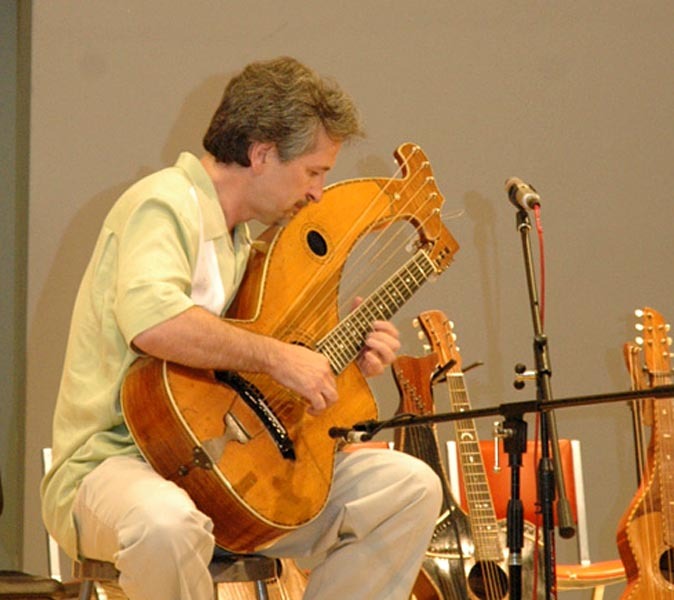 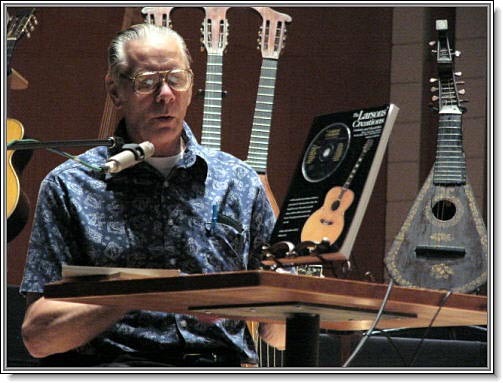 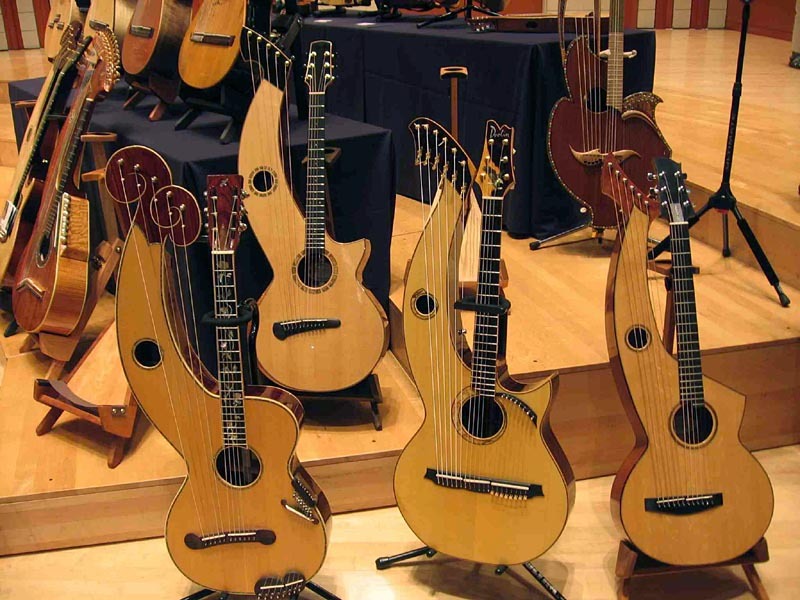 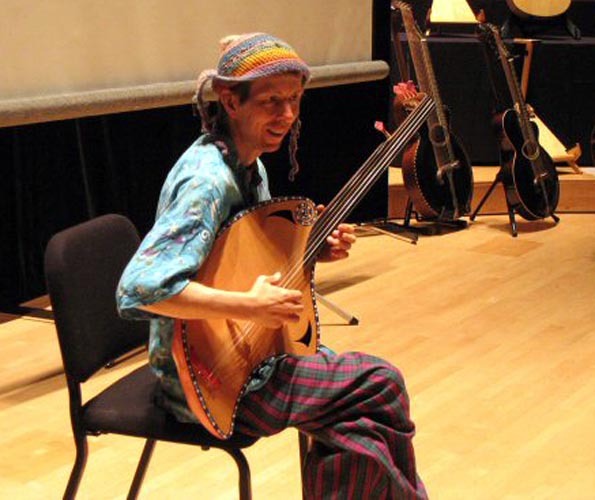 8:50 AM Welcome and overview of "Beyond Six Strings"
9:00 AM - 9:50 AM Instrument Show: "Harp guitars - Then"
Gregg Miner will discuss and demonstrate the harp guitars of The Miner Museum of Vintage, Exotic & Just Plain Unusual Musical Instruments. 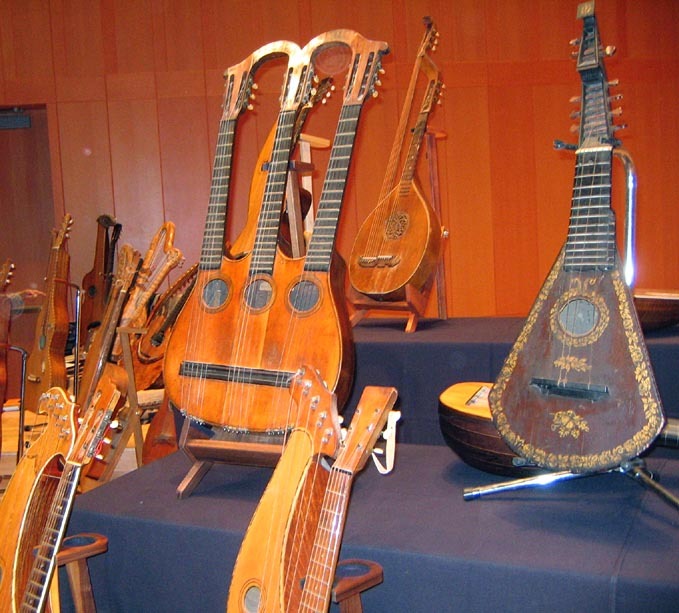 He will also briefly discuss the history pertaining to other instruments on display from the collections of John Doan, Steve Bissell, Brent Bunker and Kerry Char. 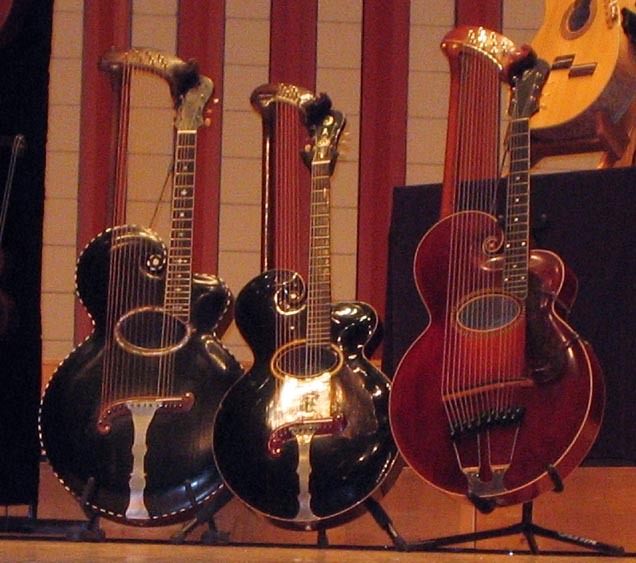 Mine are on the black backdrop, plus a couple others on the left. 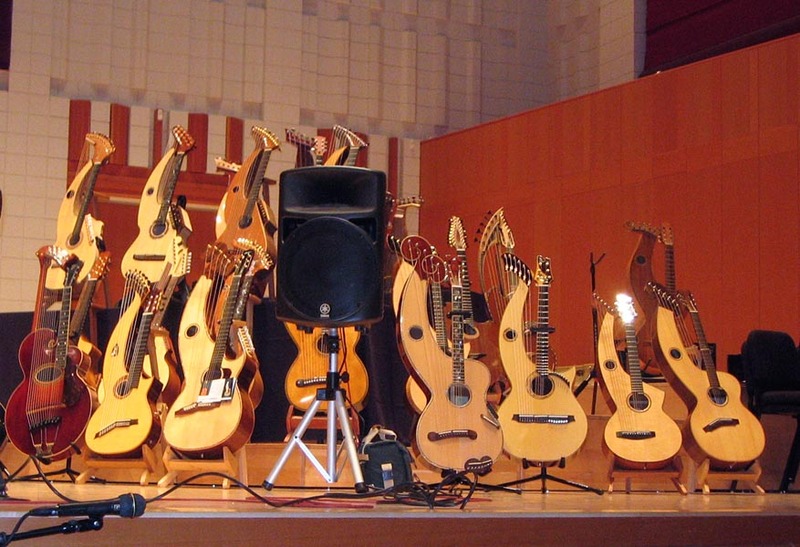 I had to leave several at home! 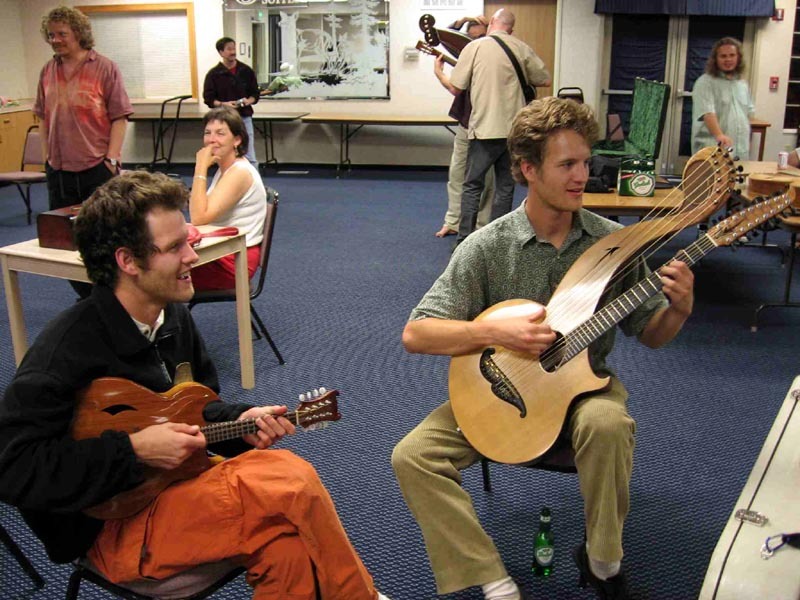 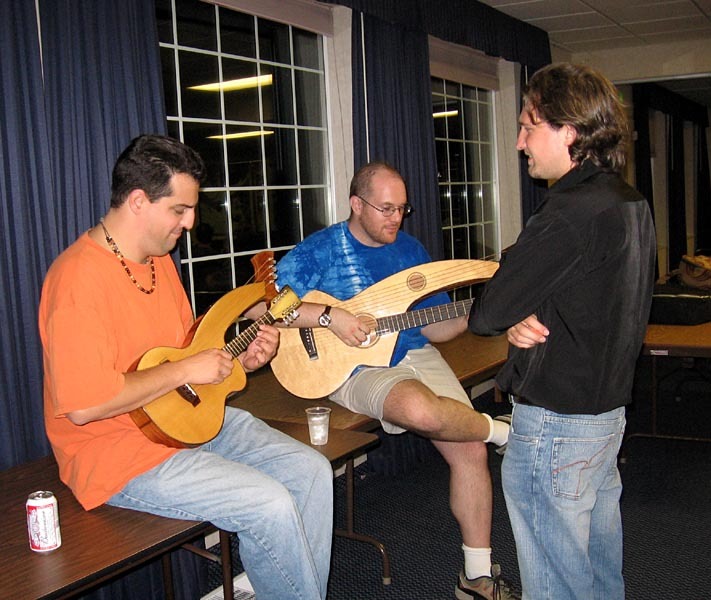 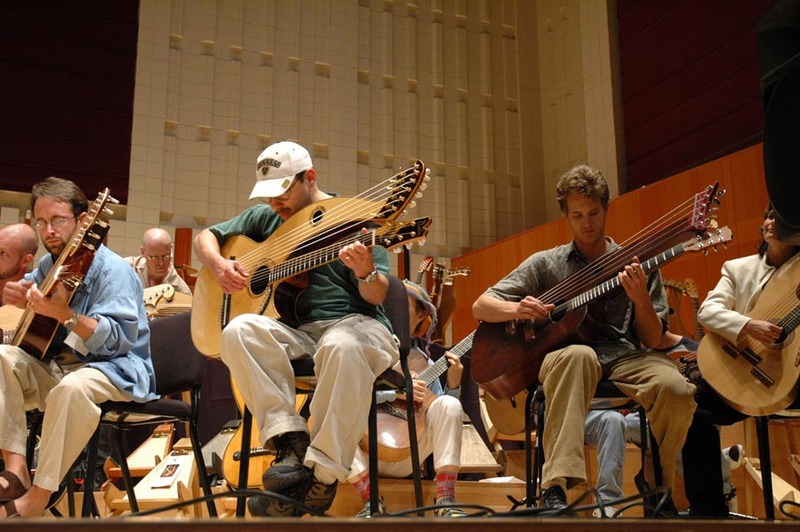 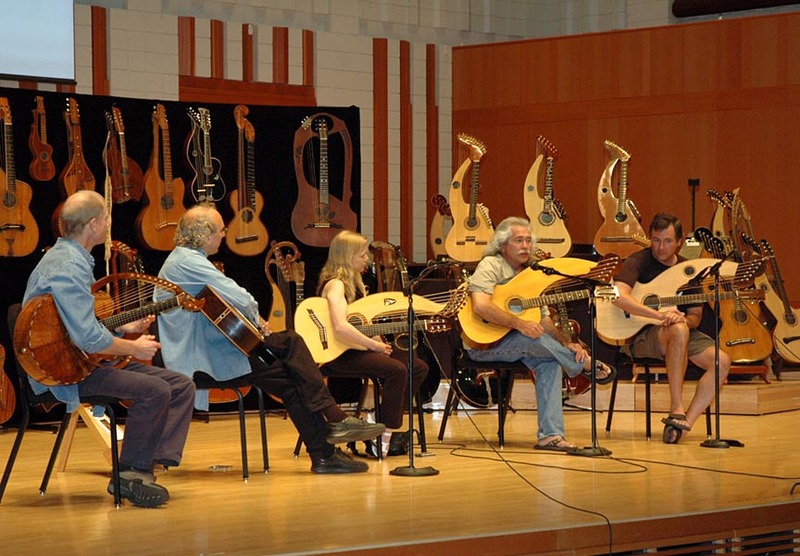 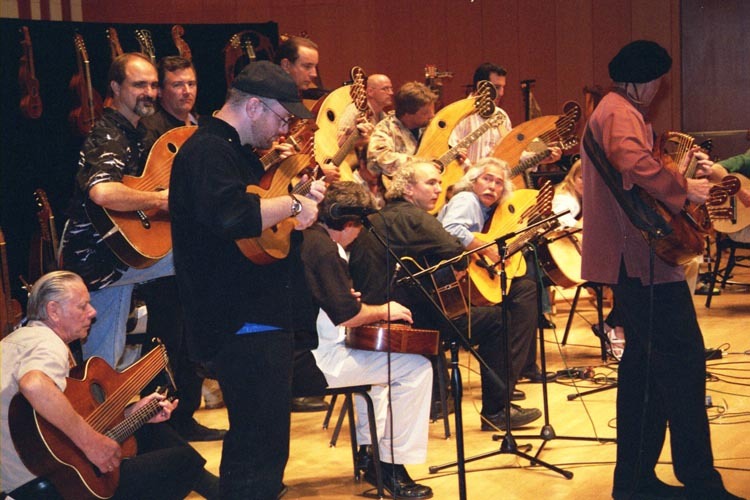 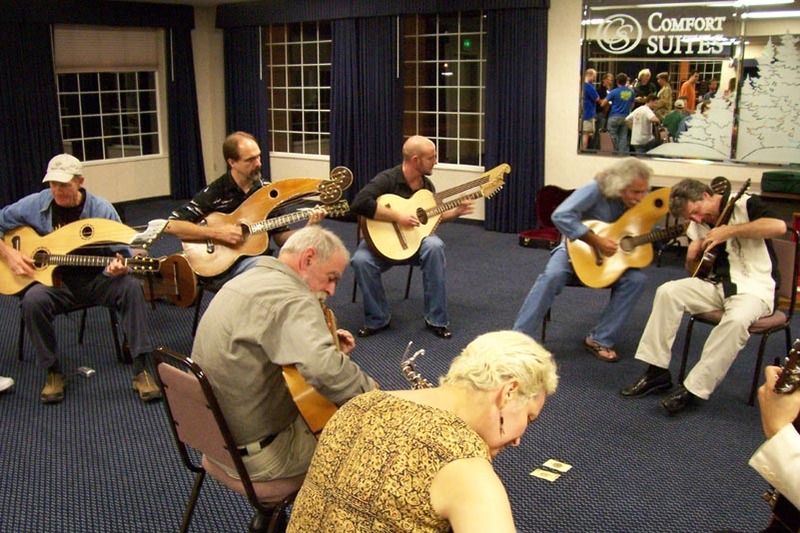 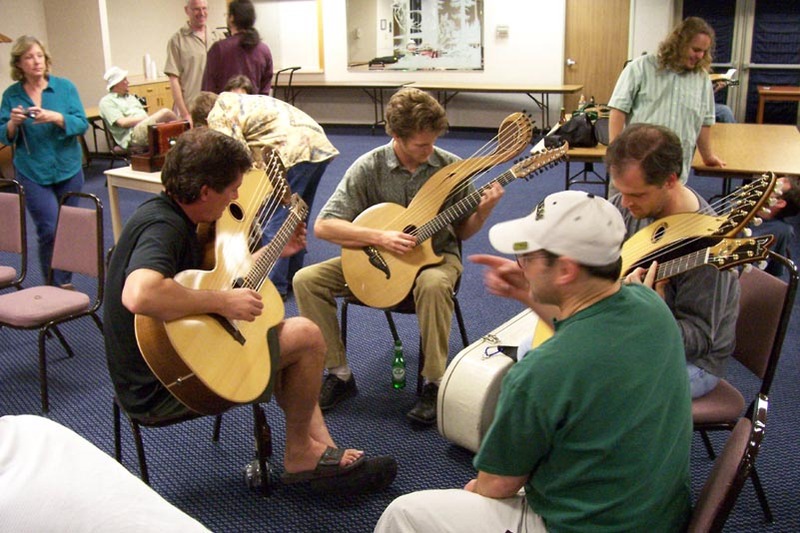 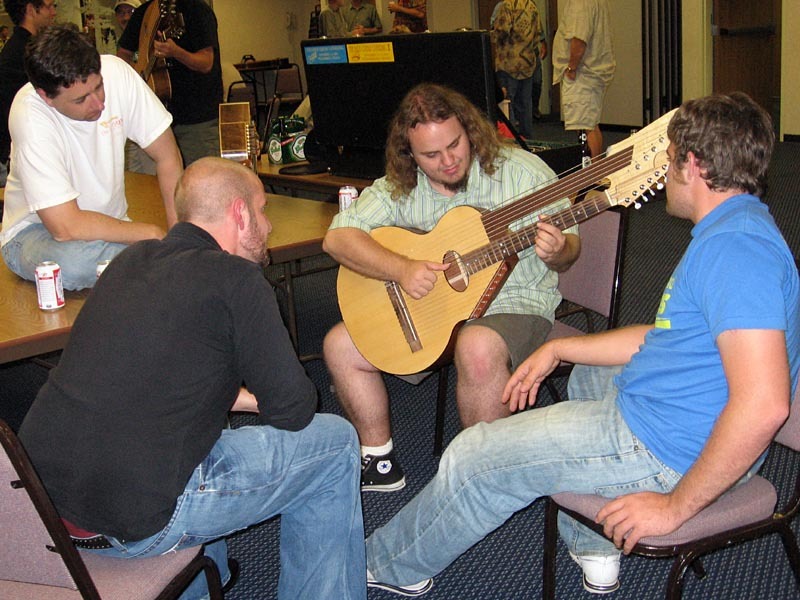 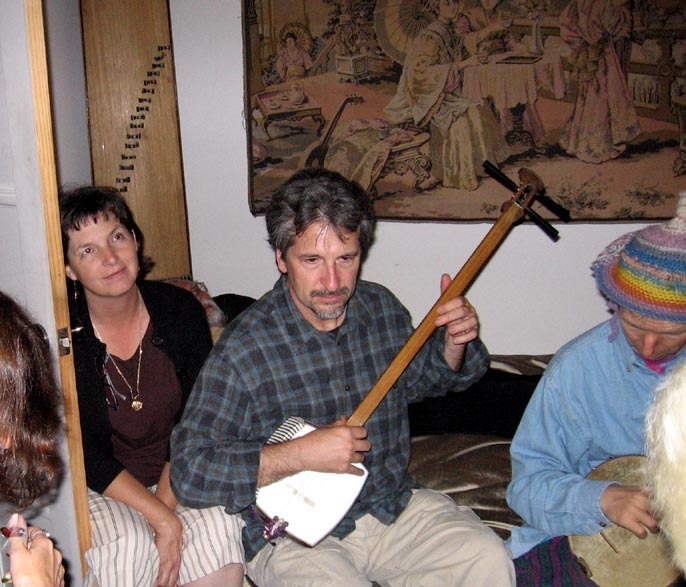 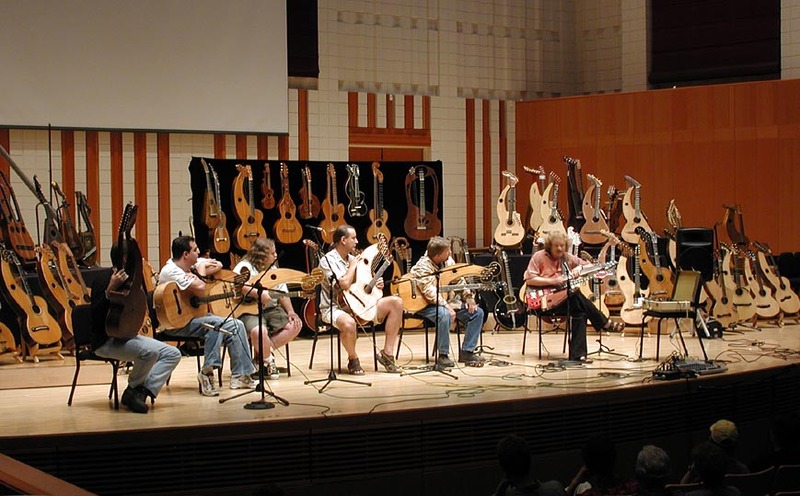 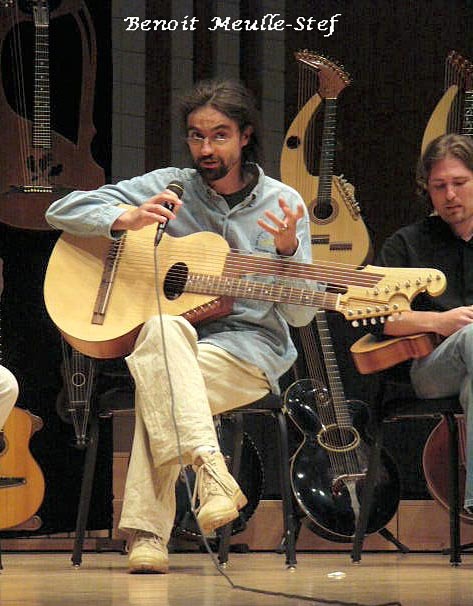 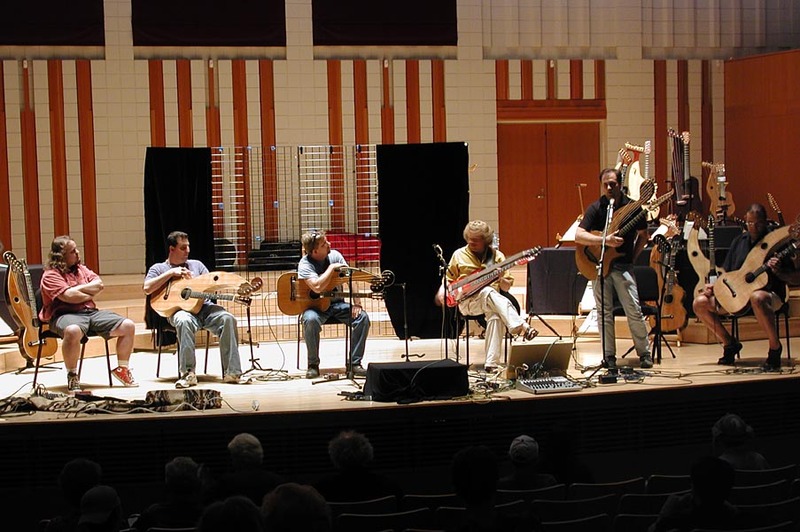 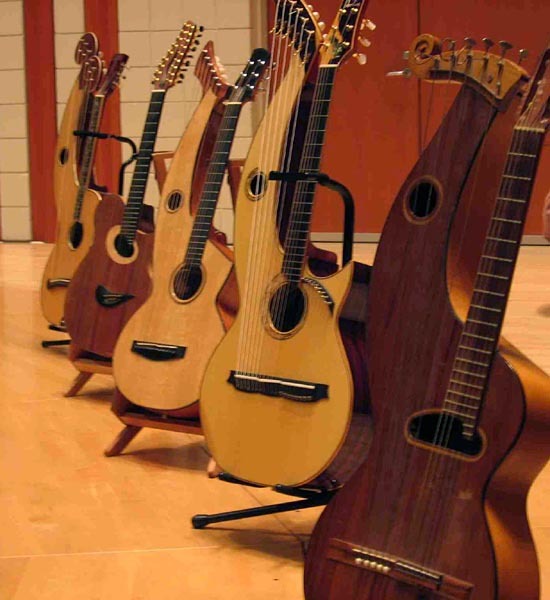 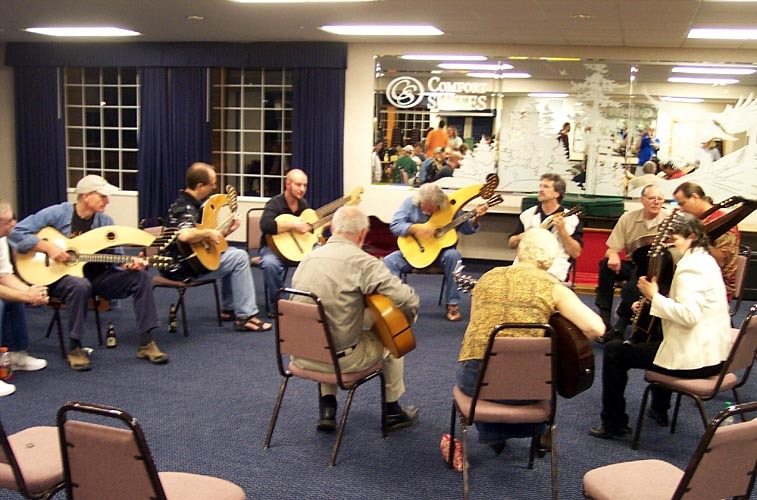 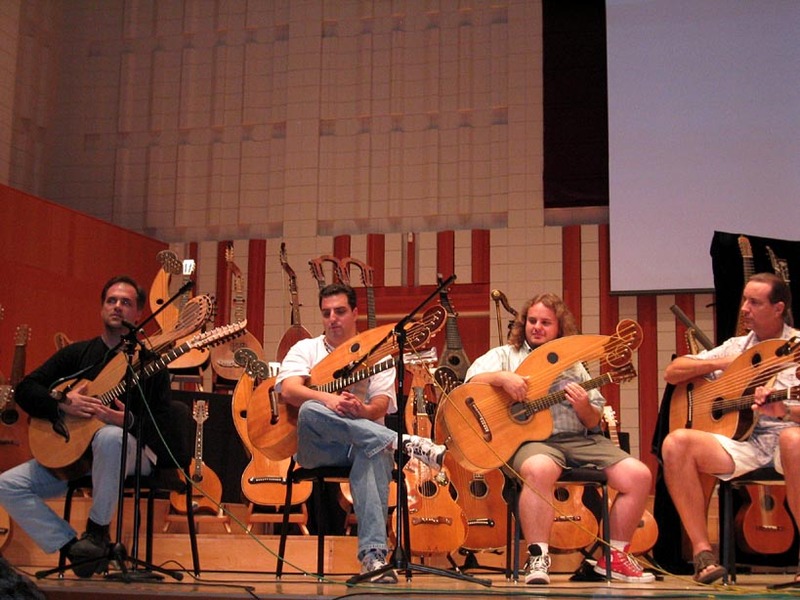 Players present a cross section of approaches to composing music for the instrument that is unique to the harp guitar. 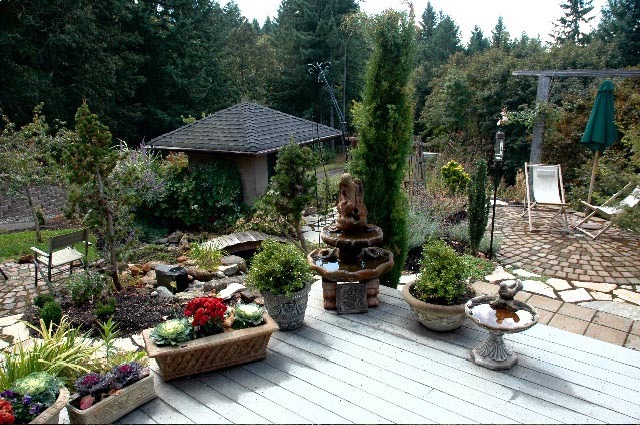 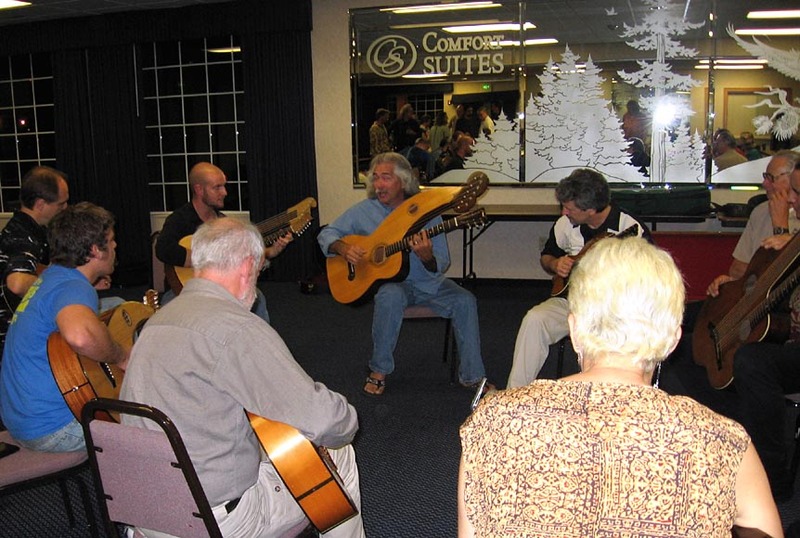 Performers to include: Muriel Andersen, Stephen Bennett, Larry Berwald, Bill Dutcher, John Doan. 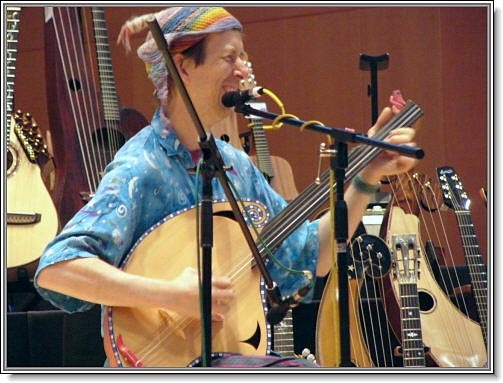 William Eaton. 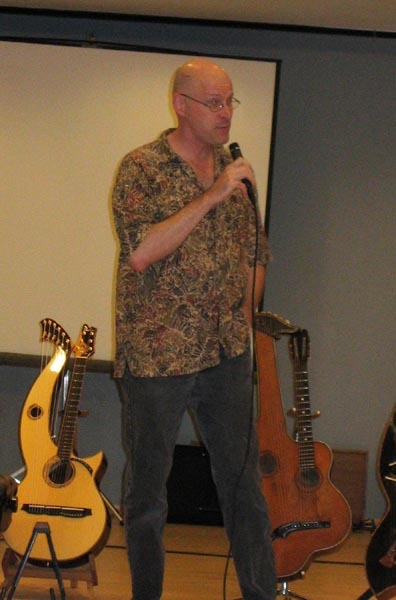 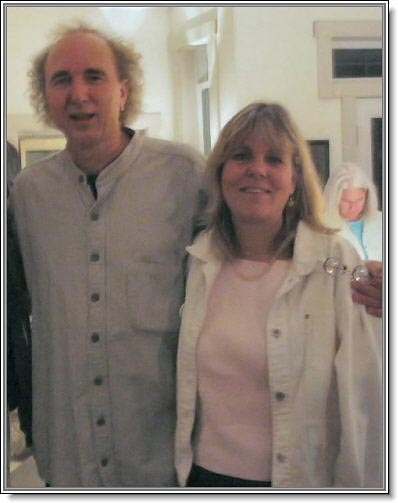 Larry Berwald was unable to attend. 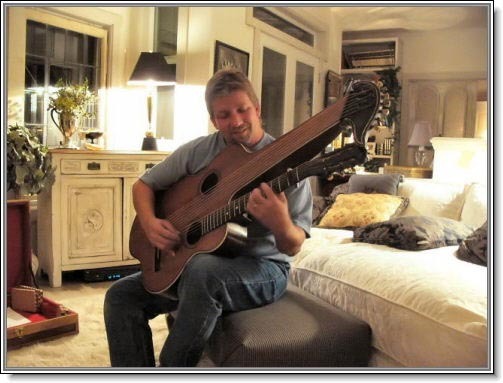 We missed him! 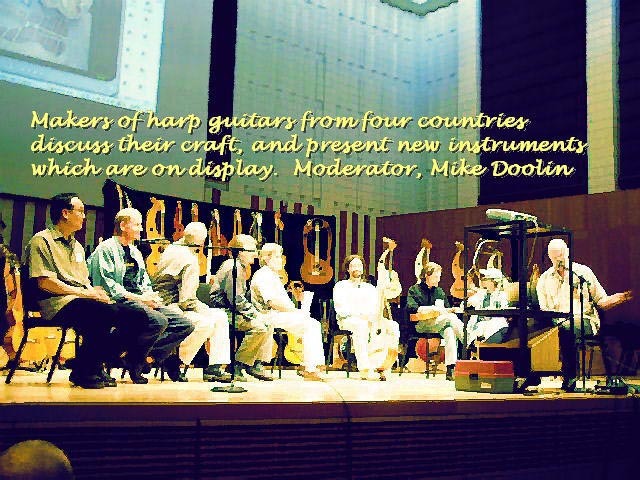 11:00 AM - 11:50 AM Luthier's Forum: "Harp Guitars - Now"
Mike Doolin discusses overview of new instruments on display by leading makers of harp guitars today to include Mike Doolin, John Sullivan, Jeffrey Elliott, Kerry Char, Stephen Sedgwick, Benoît Meulle-Stef, William Eaton, Fred Carlson and Michael Dunn. 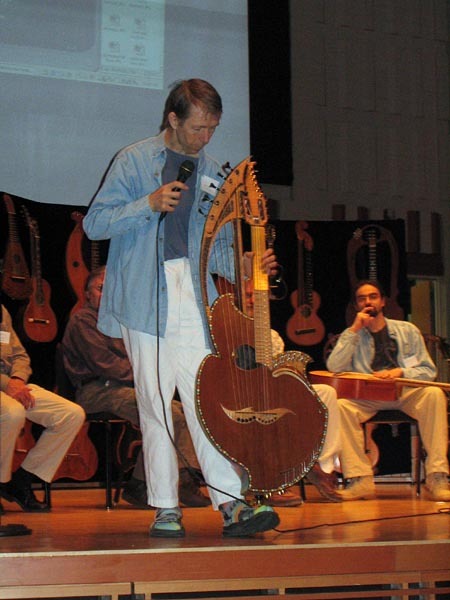 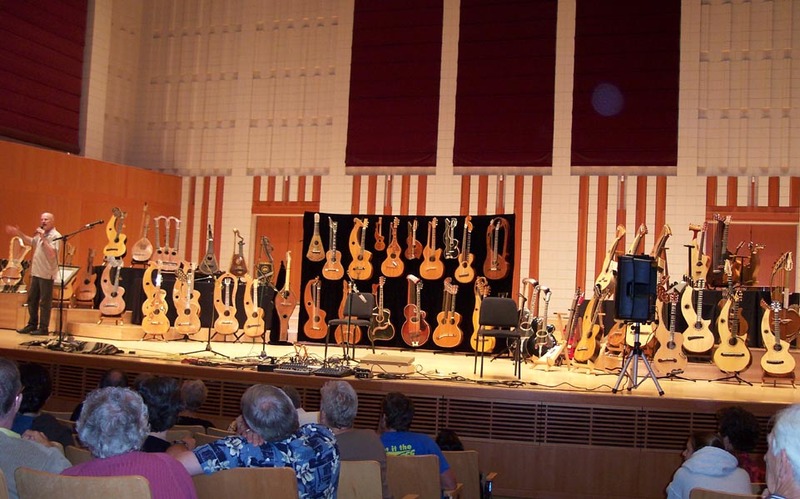 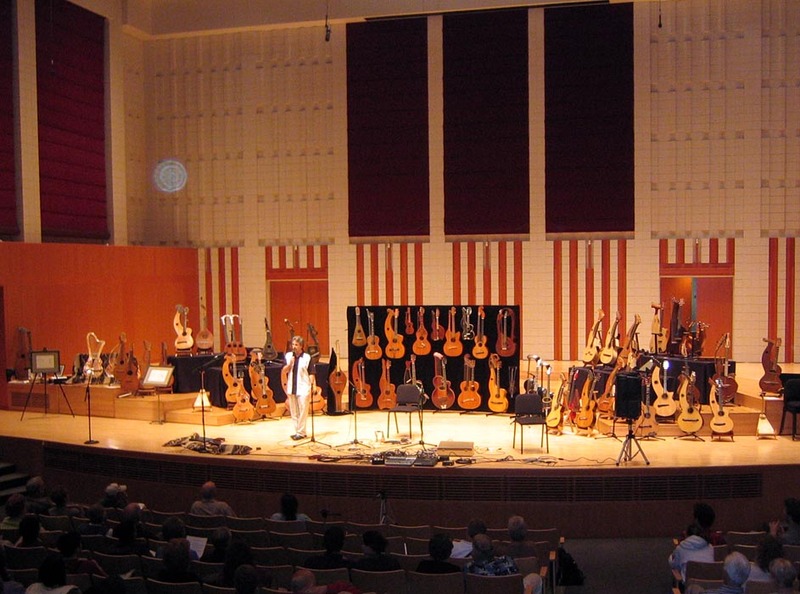 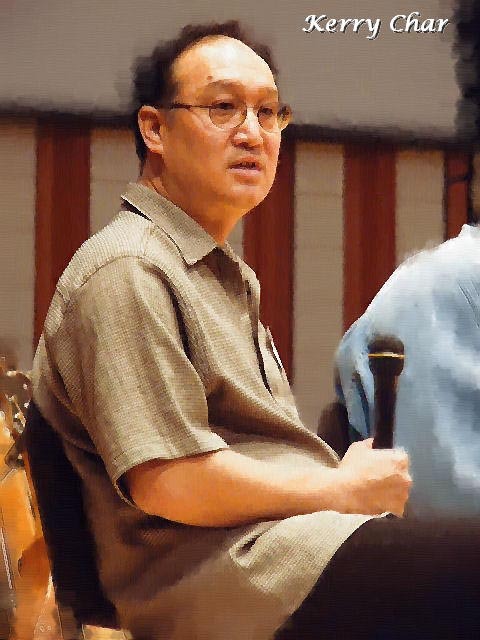 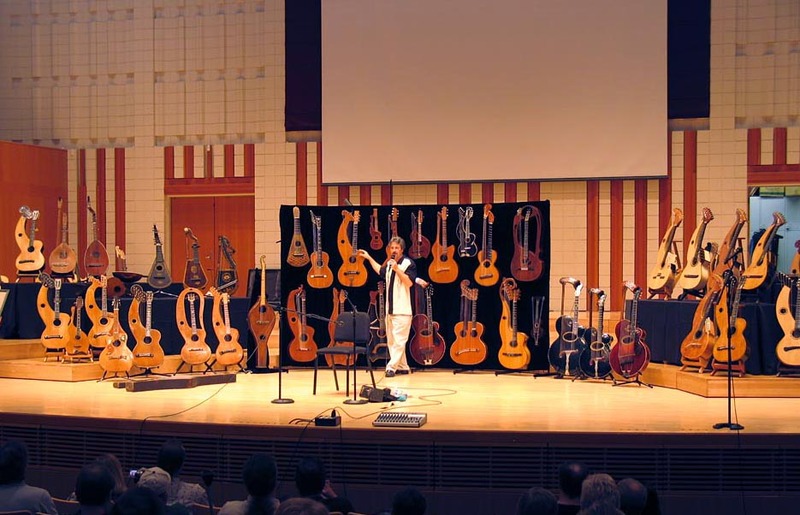 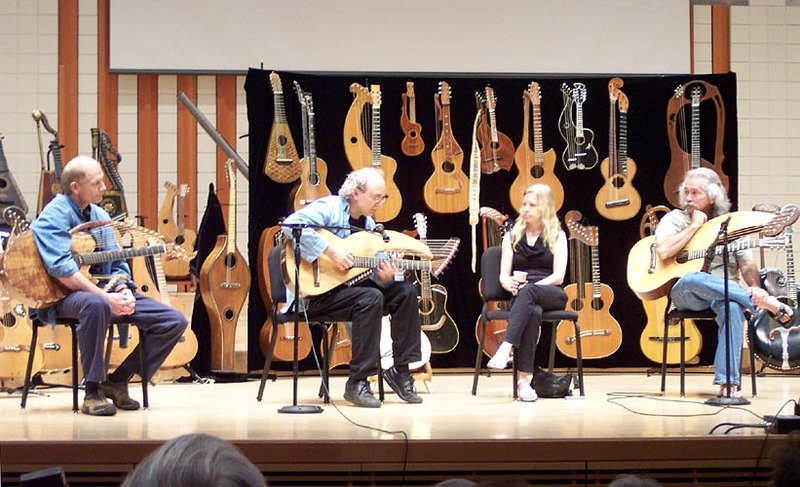 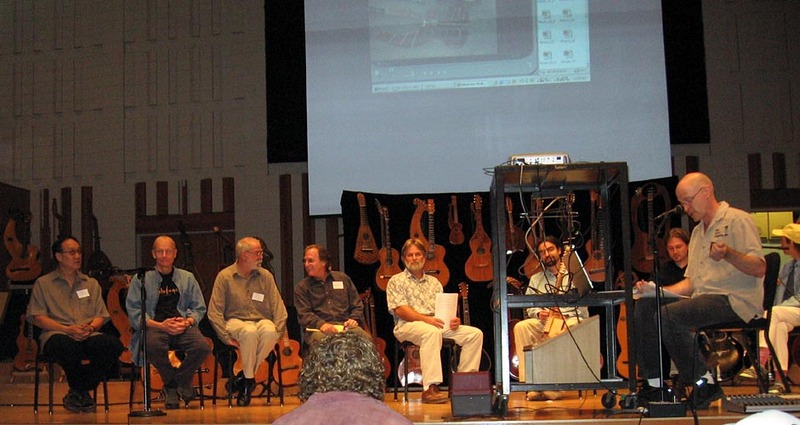 Mike will then moderate a discussion among a panel of harp guitar luthiers who will discuss the latest designs in harp guitars today followed by questions from the audience. 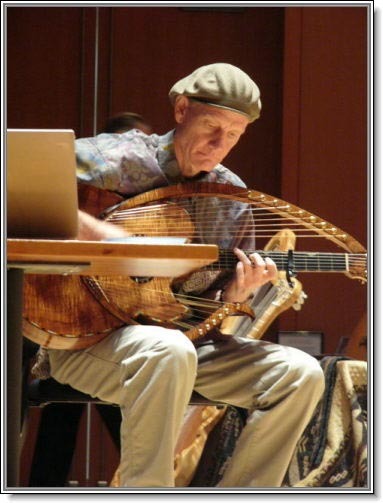 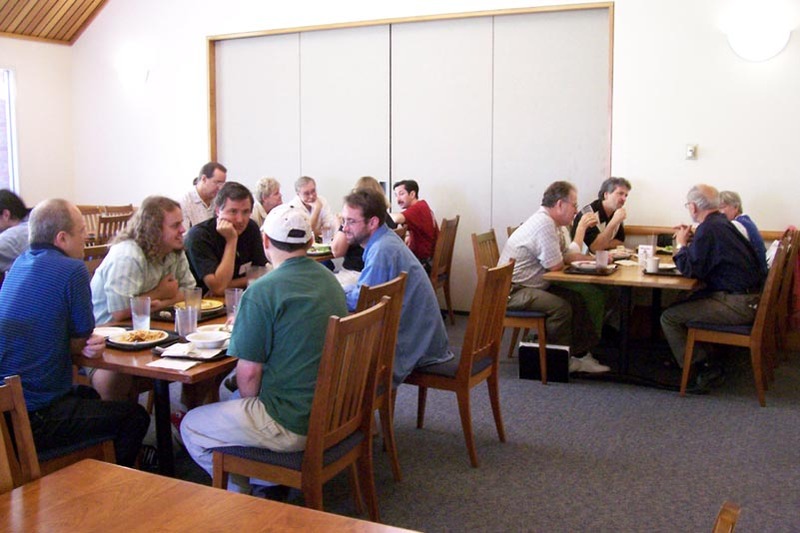 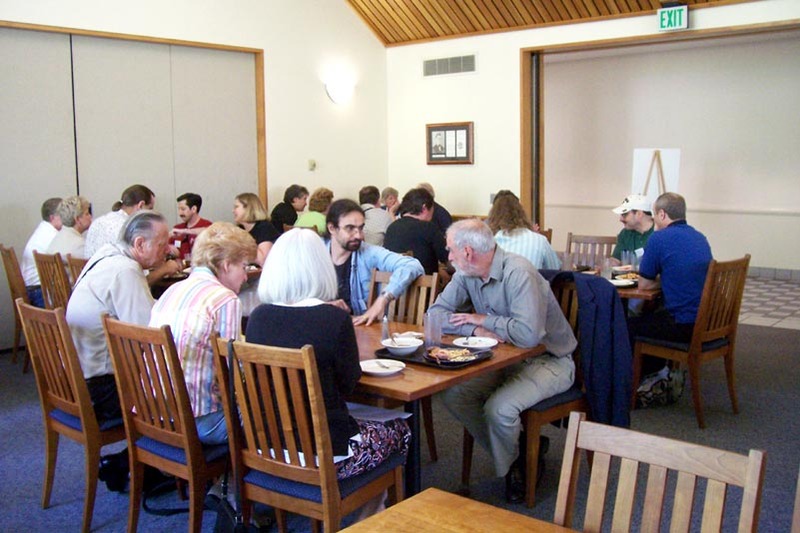 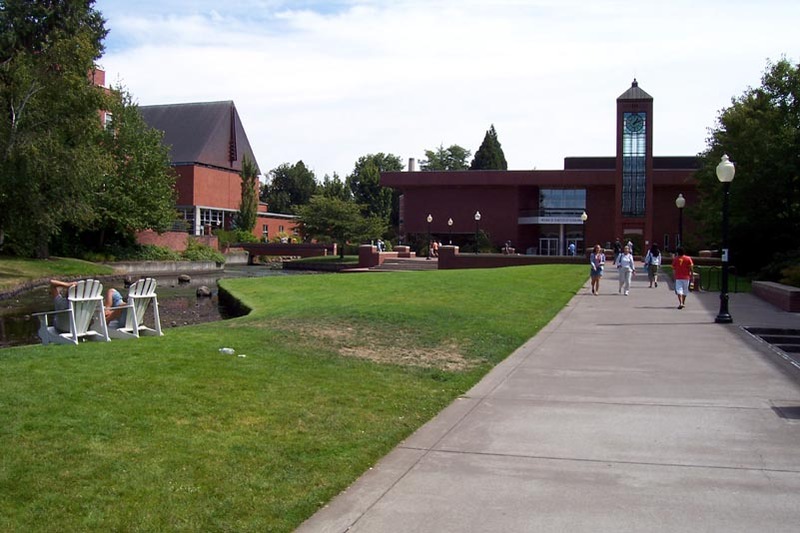 Special slideshows by Nancy Noe: The "Luthier's Forum"
12:00 PM Lunch - Goudy Hall on the campus of Willamette University. 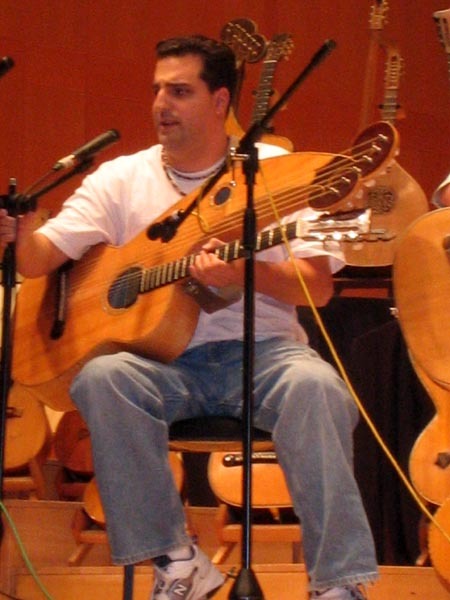 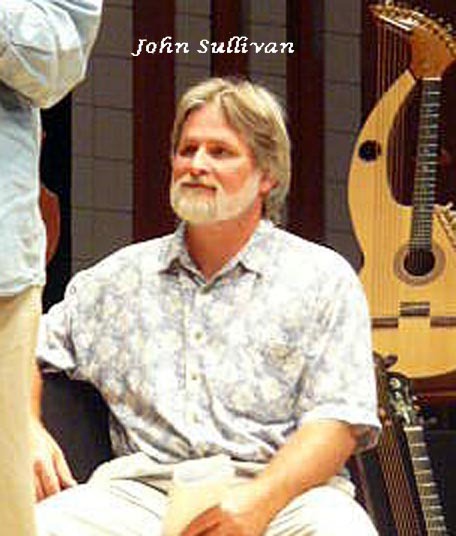 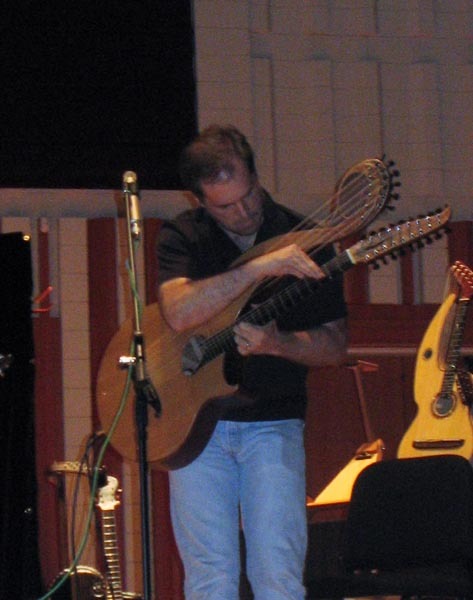 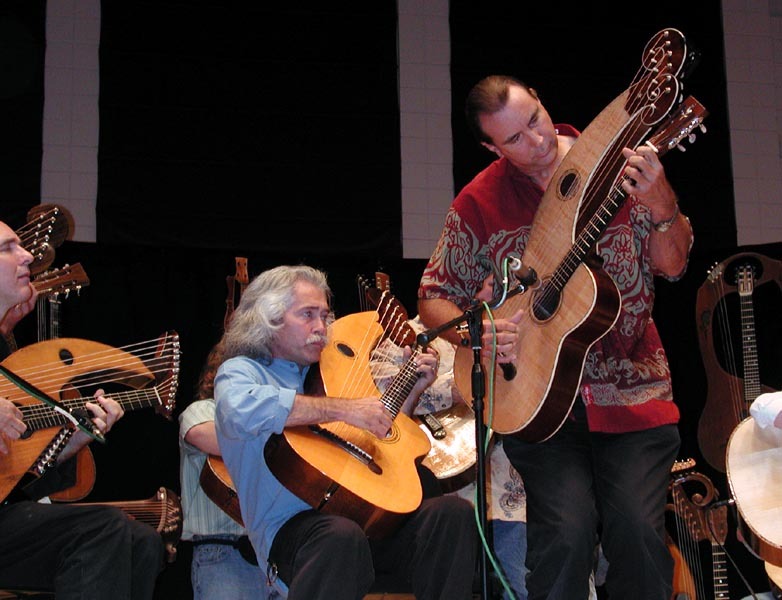 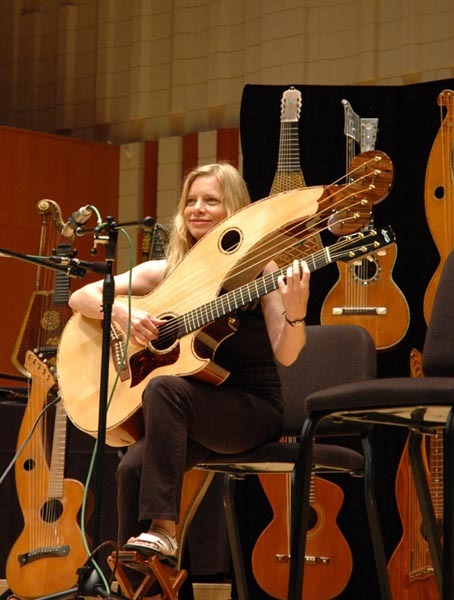 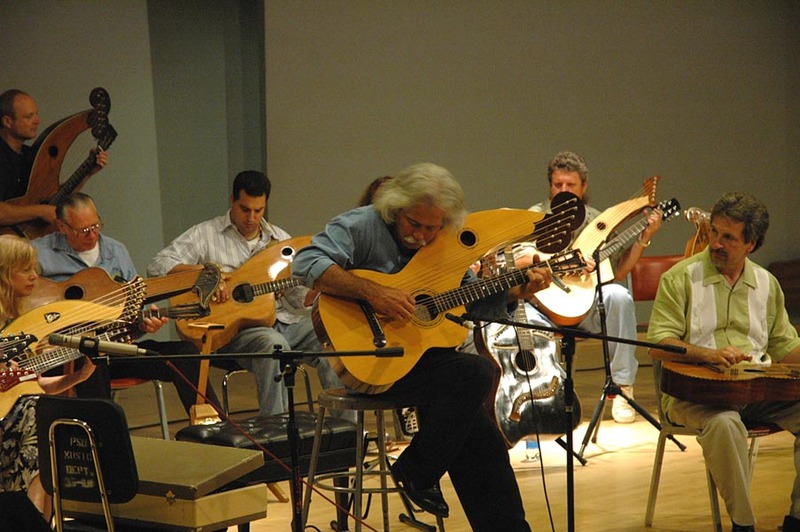 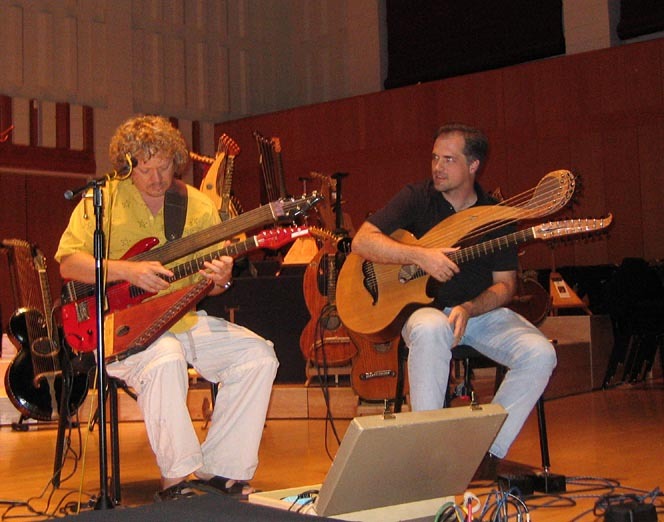 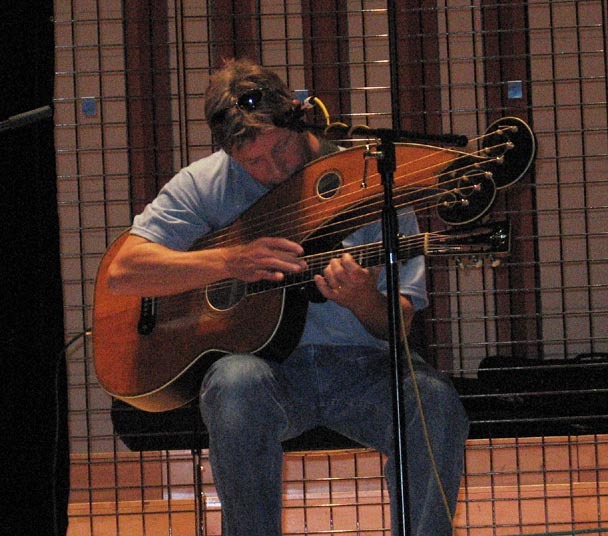 Players continue to present a cross section of approaches to composing music for the instrument that is unique to the harp guitar. 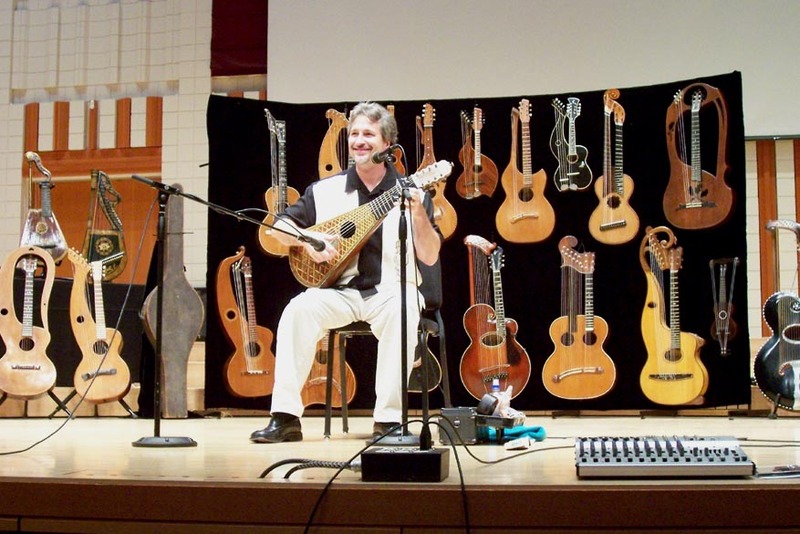 Performers to include: Stacy Hobbs, Dan LaVoie, Andy McKee, Tom Shinness, Jeff Titus, Andy Wahlberg. 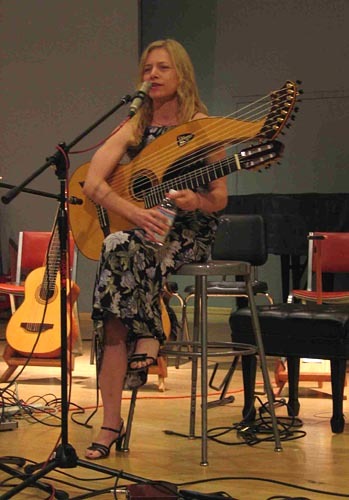 Watch and listen to Stacy's portion of the HGG3 Composing Clinic - introducing the CAGED system to the harp guitar. 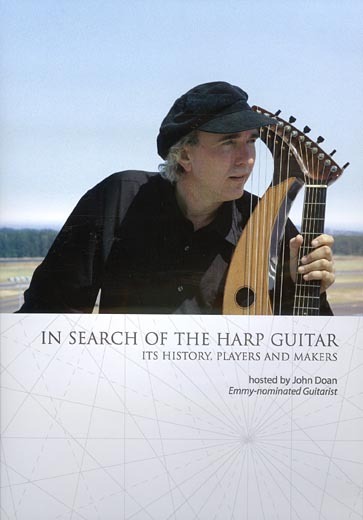 3:00 PM - 4:45 PM "In Search of the Harp Guitar"
Debut Video showing of the new DVD. 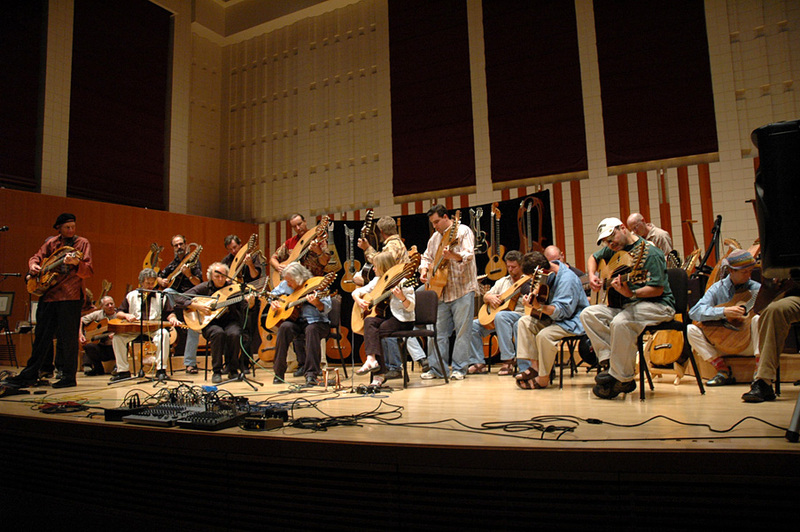 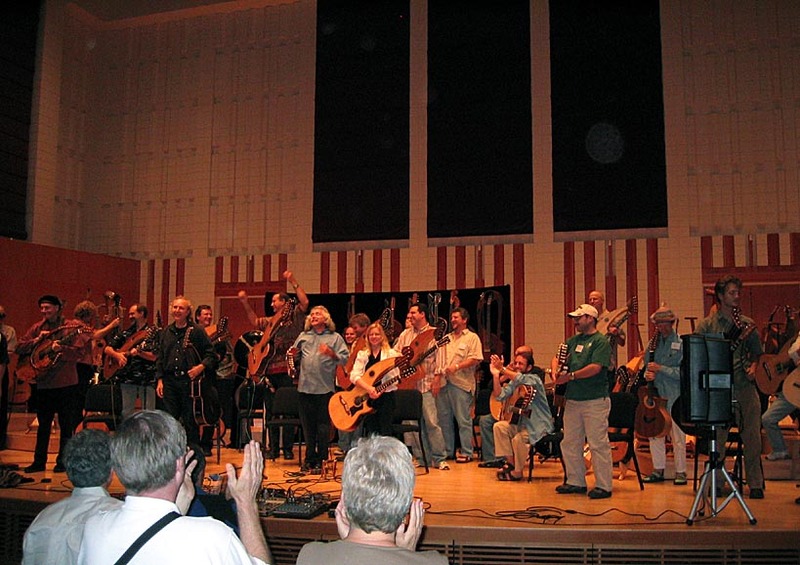 5:00 PM - 5:30 PM Rehearsal of "The Water is Wide"
- by all harp guitarists for evening concert finale. 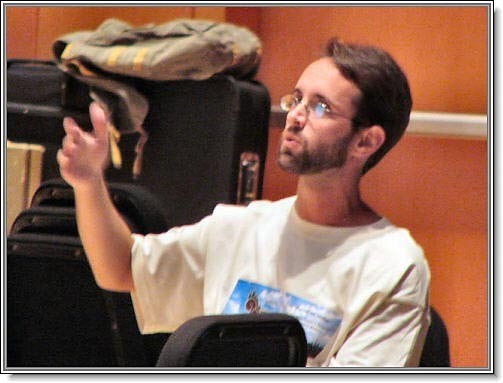 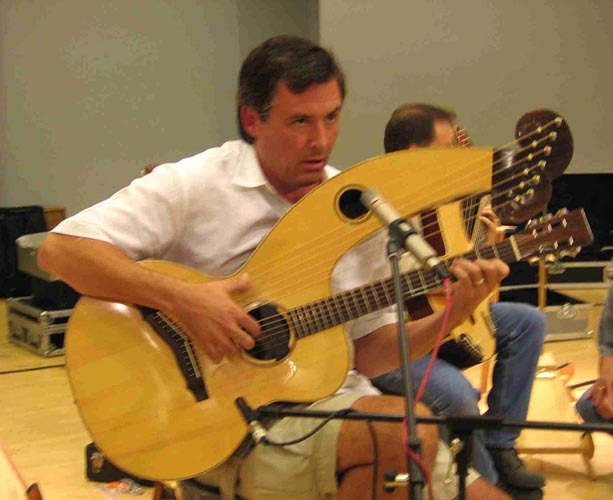 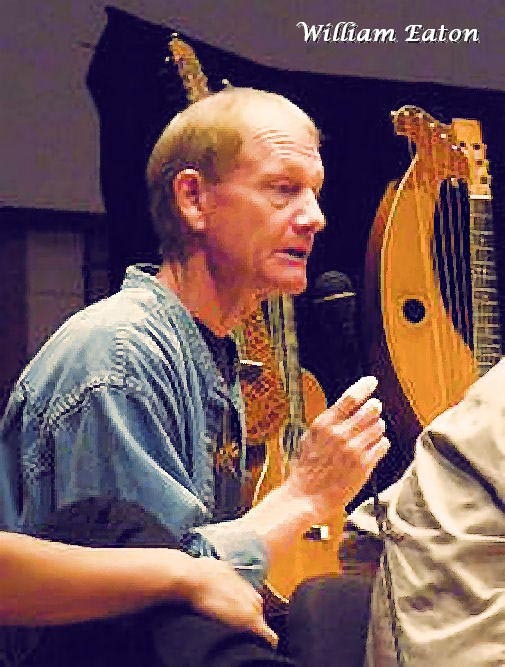 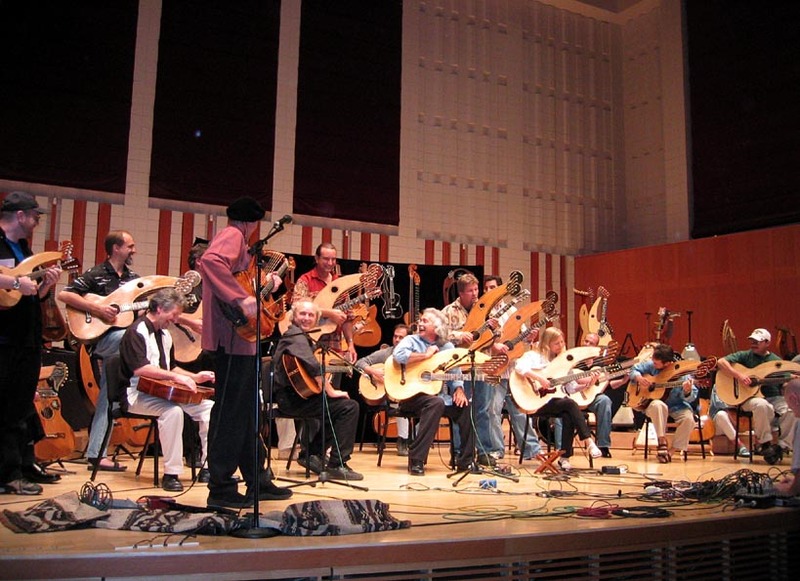 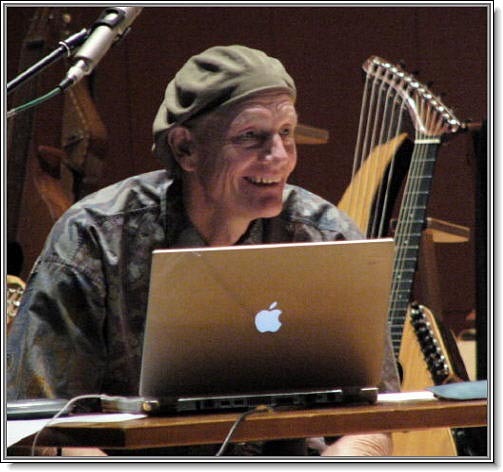 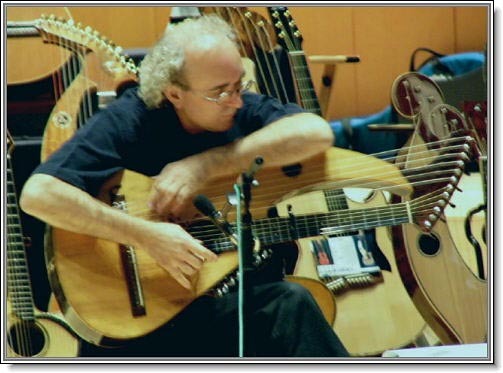 Maestro Stephen Bennett will conduct the International Harp Guitar Orchestra. 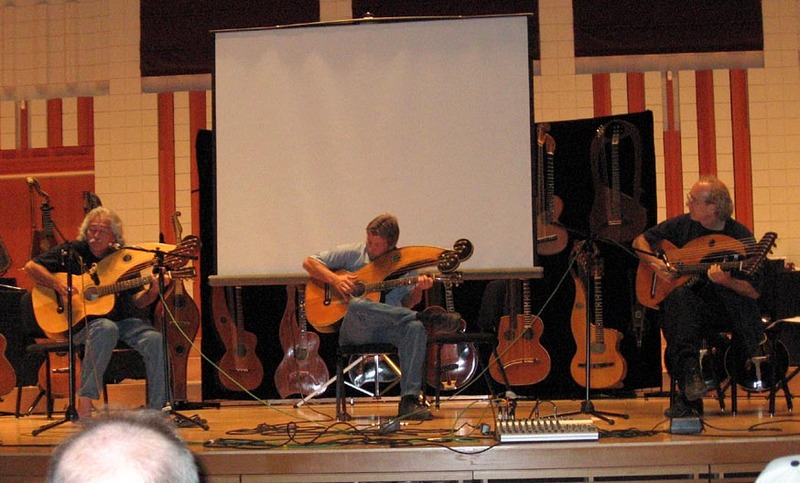 Gregg Miner and Mike Doolin trade off speaking to the public about the display. 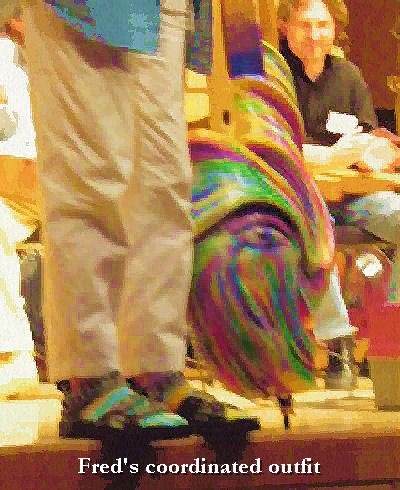 Special slideshows by Nancy Noe: "The Concert"
...and our favorite closer - the Water is Wide group finale. 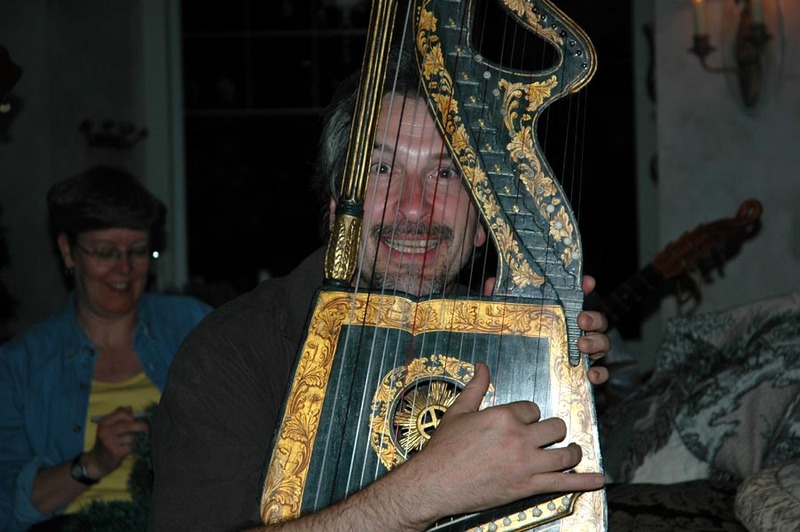 Oh, the fun we are having! 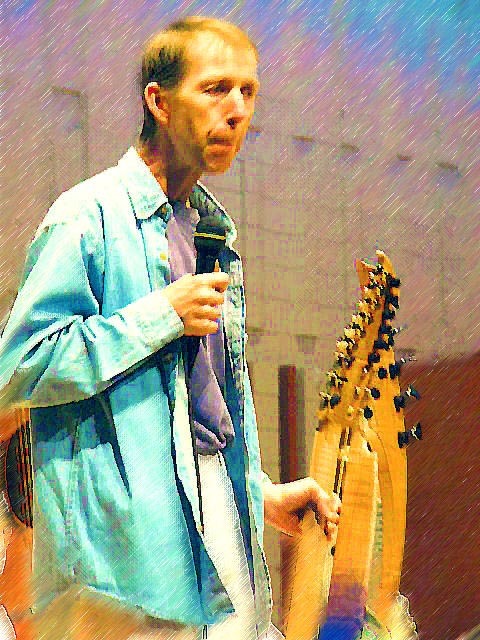 This is an open mic opportunity for harp guitarists not already featured elsewhere in the schedule to come forward and be heard. 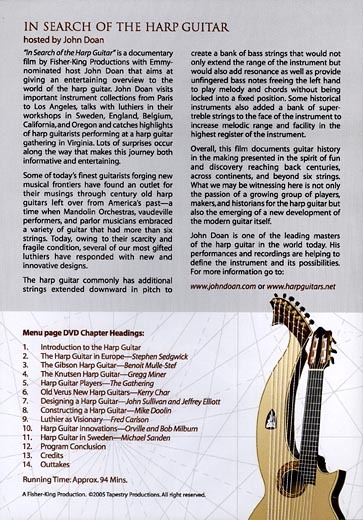 Harp Guitar Notation: "Harp Guitar Music in Print: In Search of a Standard"
Sheet music of specific harp guitar pieces are handed out and discussed among players and participants. 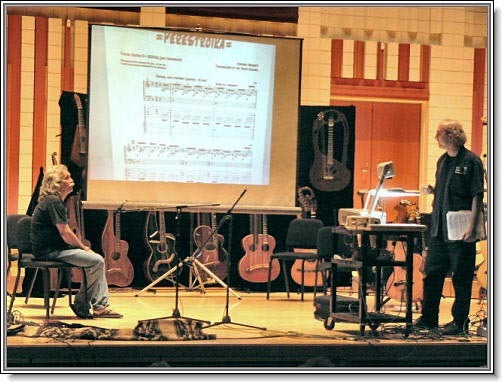 Various players/composers demonstrate select passages while participants attempt to play the music on their instruments. 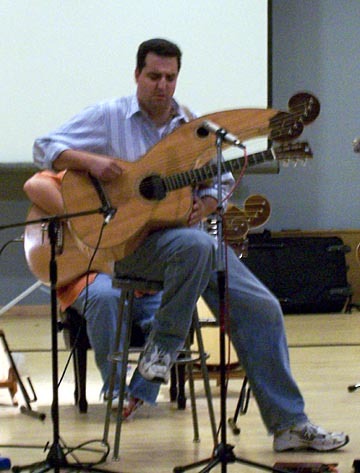 11:00 AM - 11:50 AM Players Workshop: "Playing the Harp Guitar"
Techniques unique to playing the harp guitar will be discussed and demonstrated. 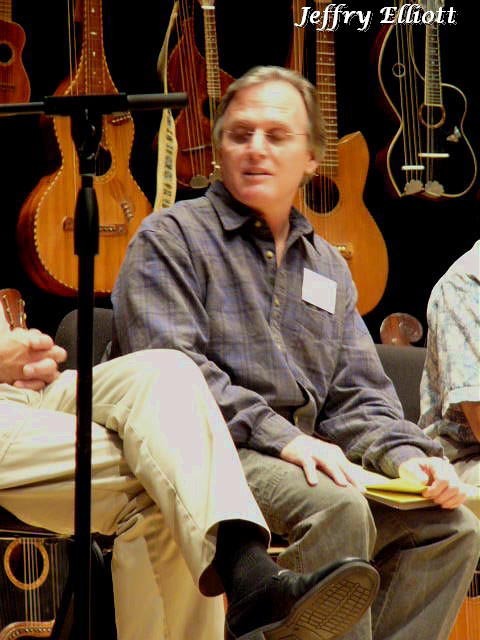 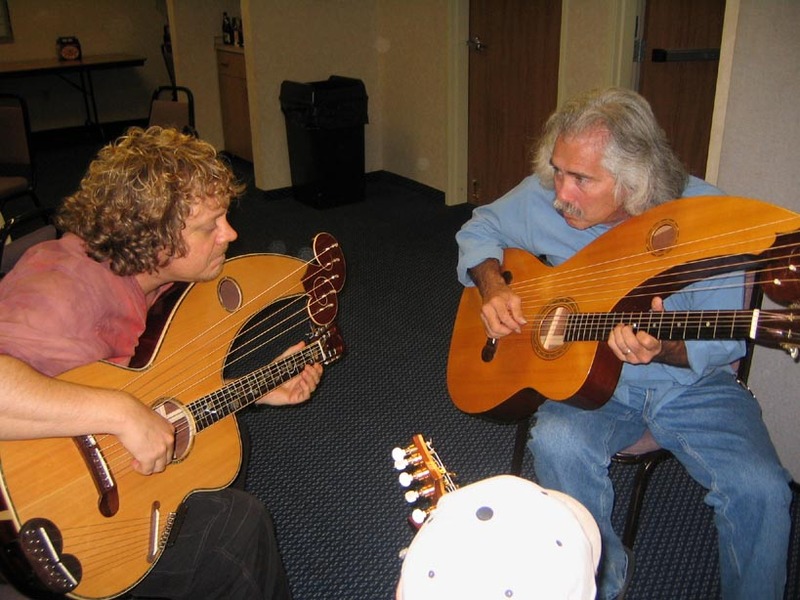 This session will be moderated by Stephen Bennett and John Doan who will touch upon various techniques for playing basses with chords and melody and incorporating super-treble strings with sub-basses. 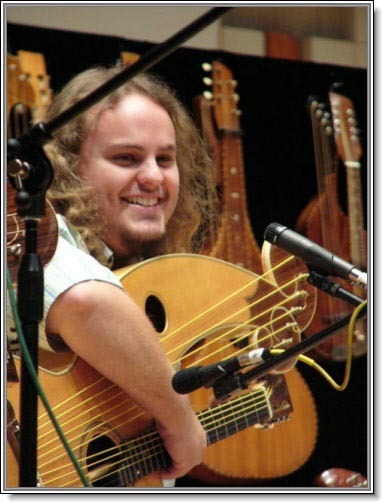 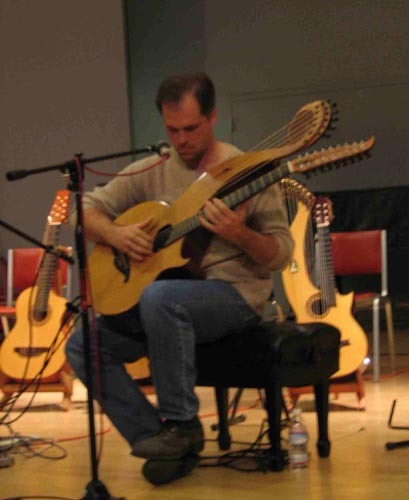 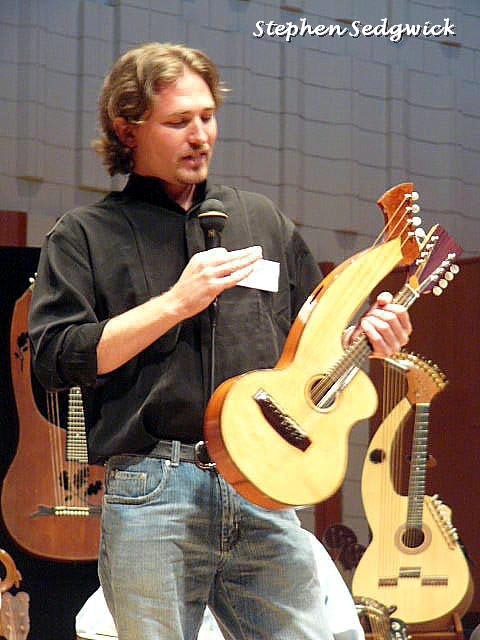 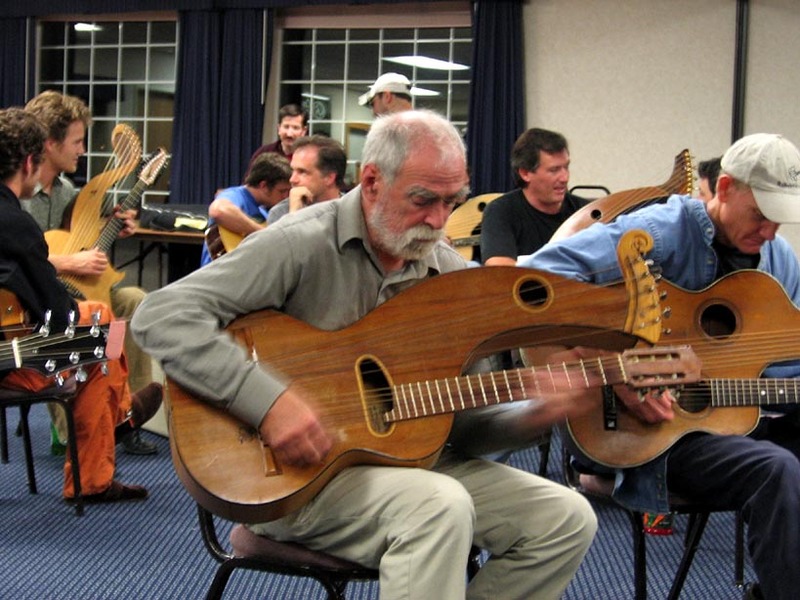 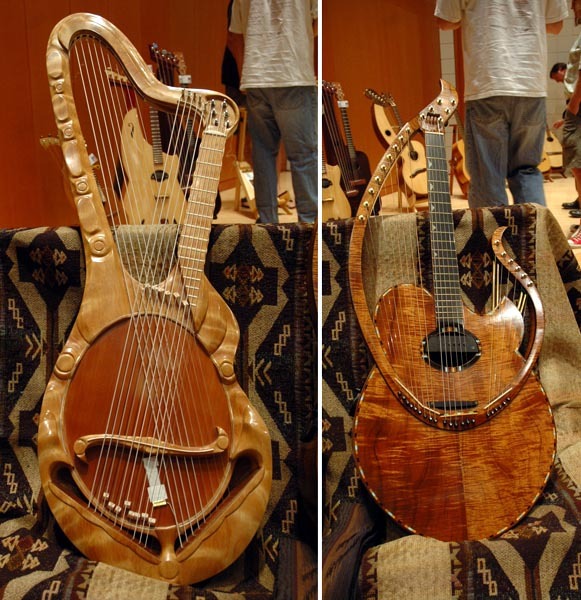 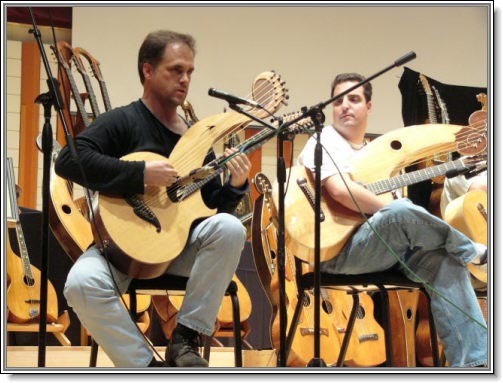 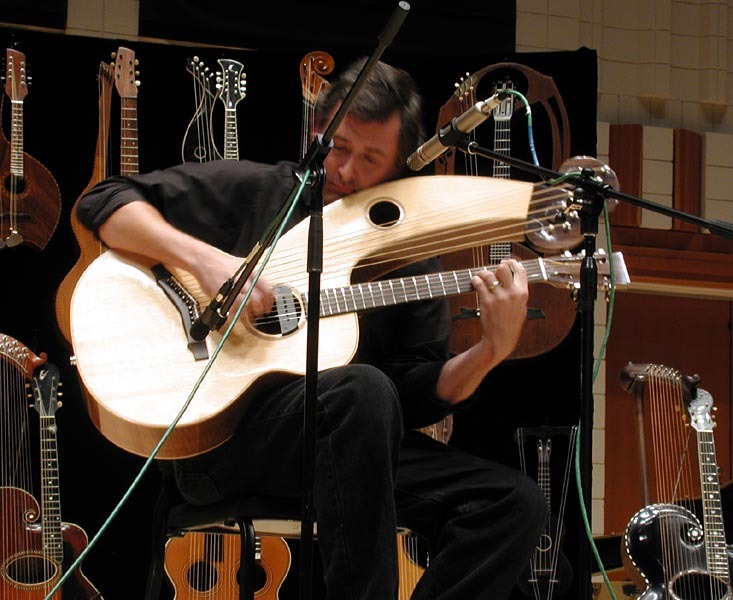 1:45 PM - 2:50 PM Luthier's Spotlight: "Harp Guitar Inspirations - A look into future designs for the harp guitar"
William Eaton and Fred Carlson, wood working virtuosos, think outside of the box when it comes to designing and building instruments. 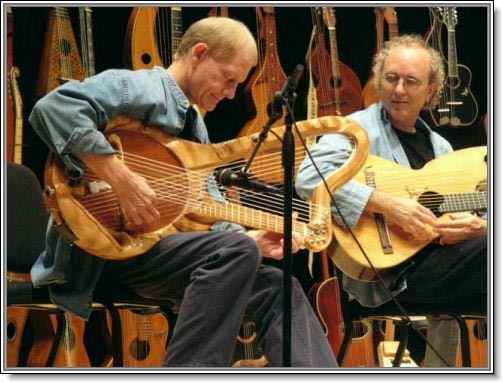 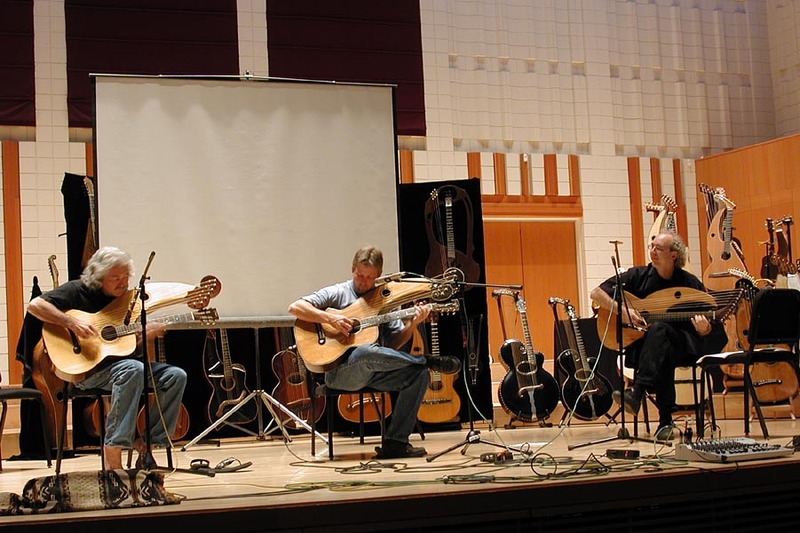 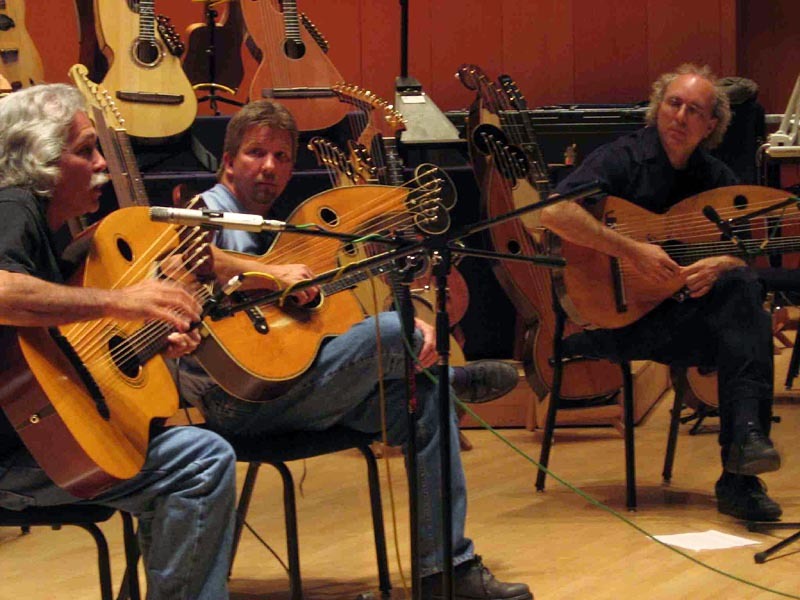 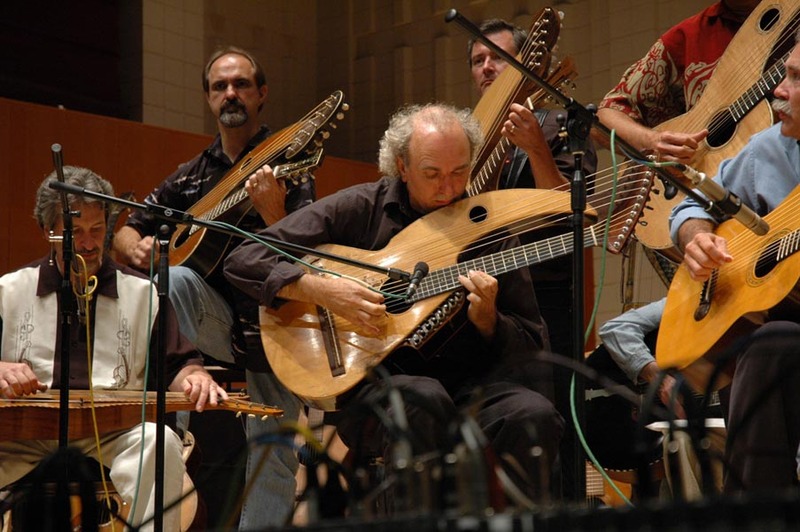 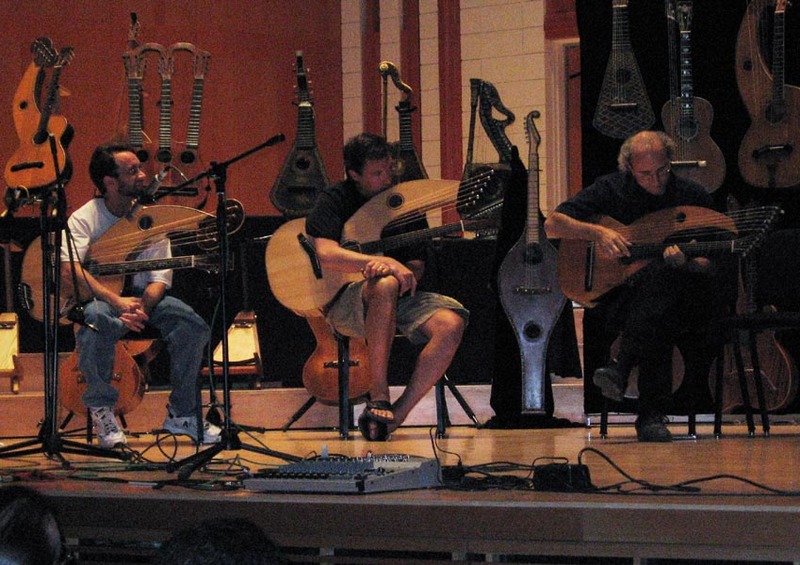 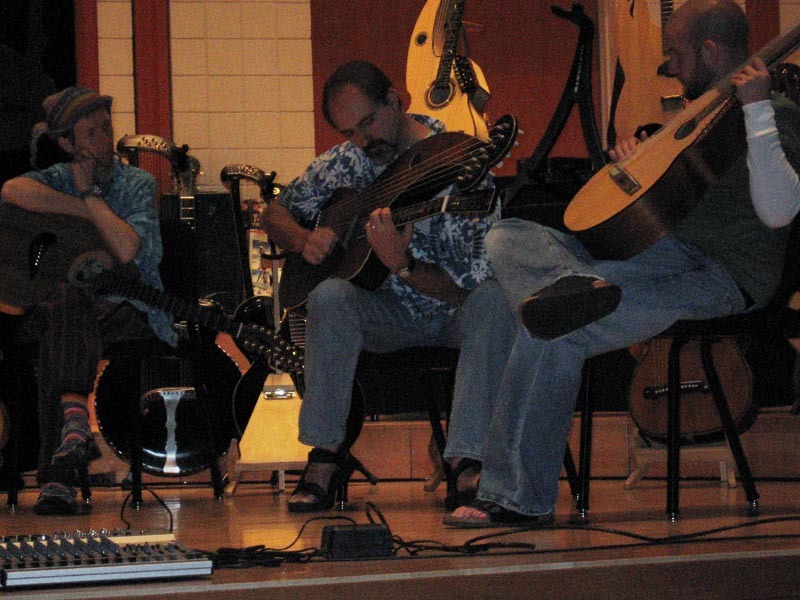 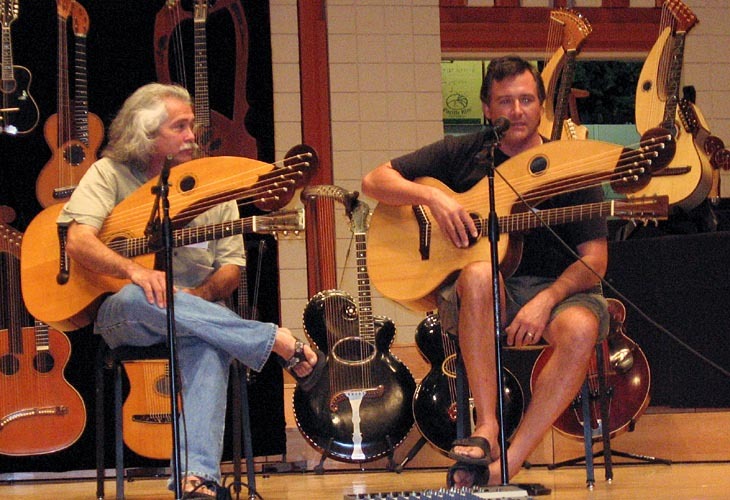 They draw upon decades of experience to discuss various harp guitar-like instruments that they have designed and built. 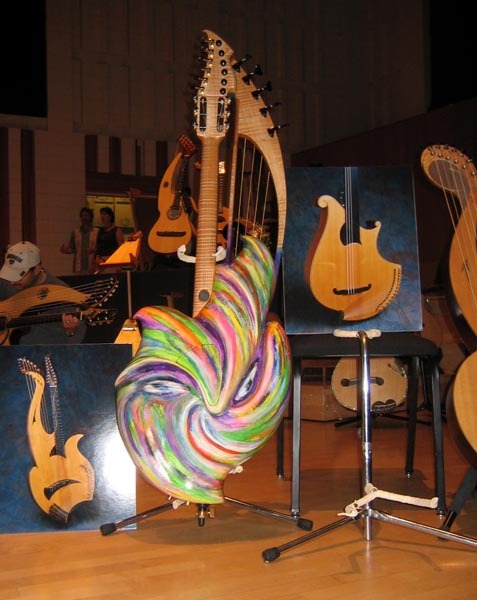 Sculpture and music come together to provide a feast for both the eyes and ears. 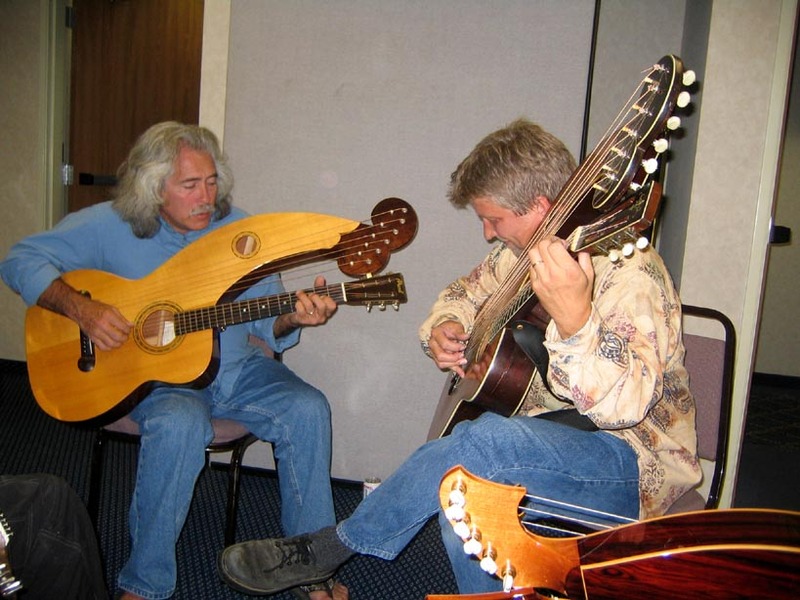 Historians Spotlight: "Harp Guitar Books in Print"
Authors Bob Hartman and Tom Noe discuss their books highlighting their continued work of researching, compiling, publishing and updating information about the Larson Brothers and Chris Knutsen who were early pioneers of the harp guitar in America. 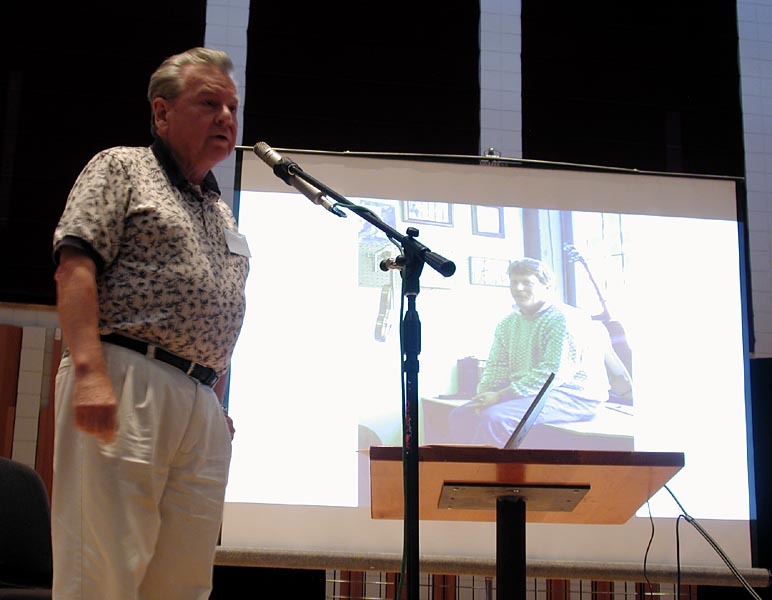 Tom spoke of his friendship and partnership with the late Dan Most. 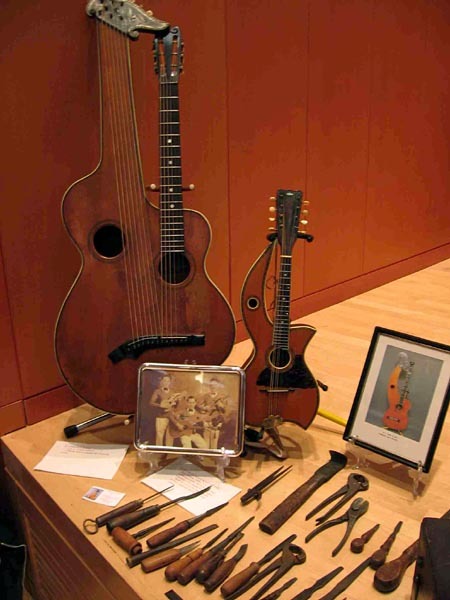 Bob's display included some of the Larson's original tools. 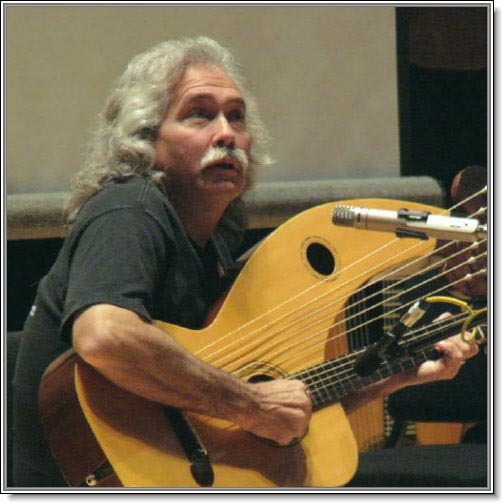 4:00 PM - 4:50 PM Players Workshop: "Harp Guitar on Hormones"
Secrets revealed to tapping, hitting, and other shameless fingerstyle techniques that will amaze and dazzle the uninitiated. 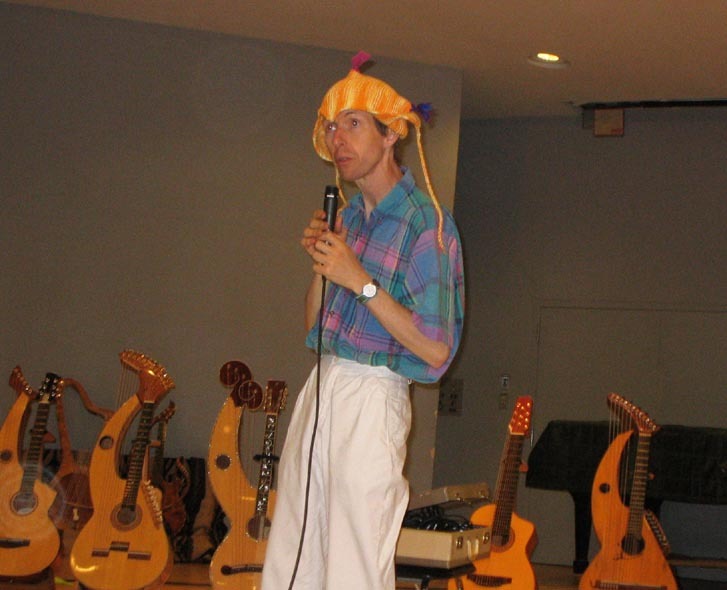 Special Presentation by Mr. 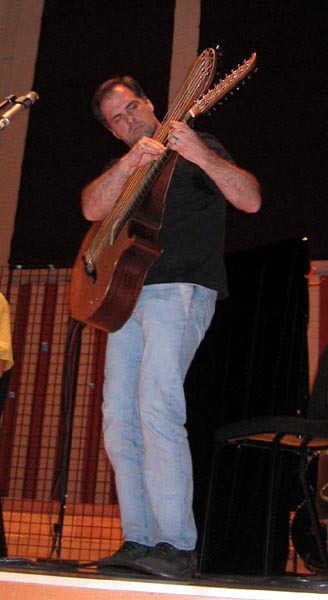 Hormone himself - Jeff Titus. 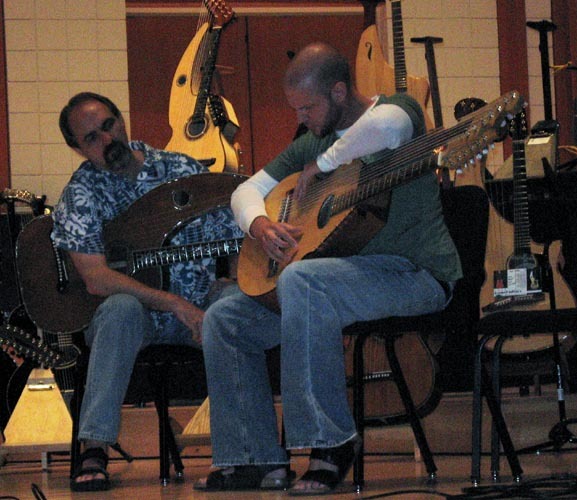 Other performers to include: Stacy Hobbs, Dan LaVoie, Andy McKee, Tom Shinness, and Andy Wahlberg. 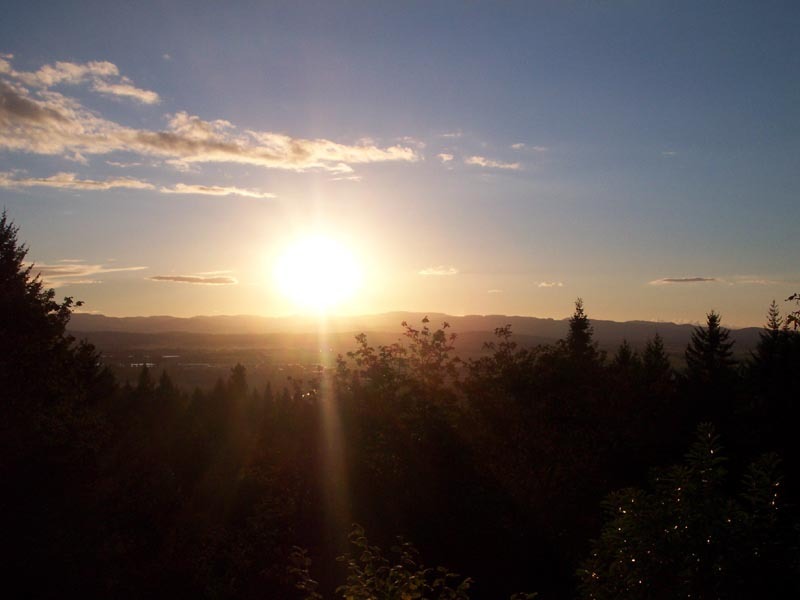 Informal gathering of participants with breathtaking sunset views from atop an extinct volcanic plug 700 feet above the valley floor. 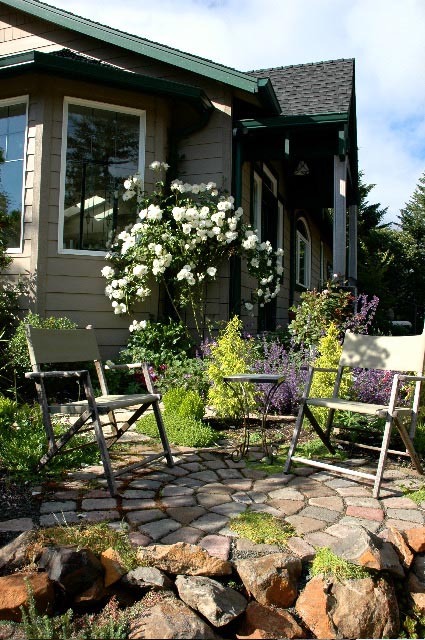 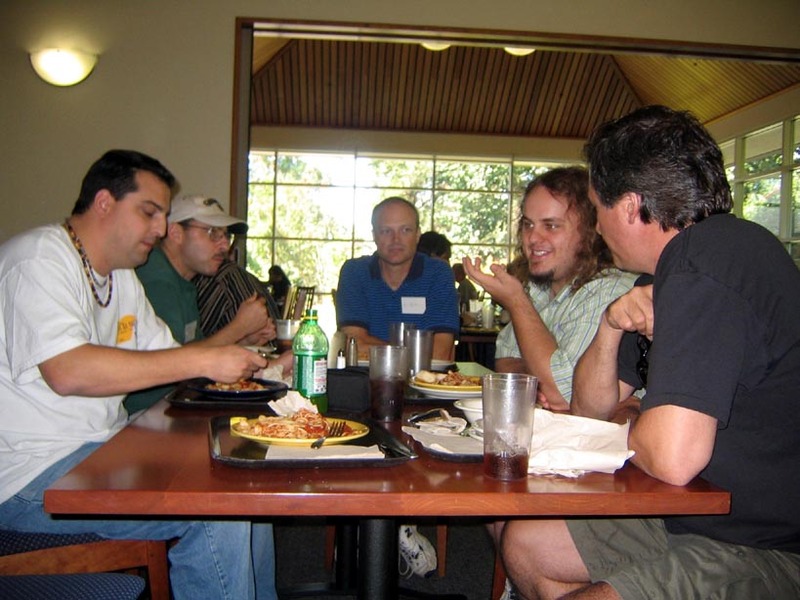 Take time to finish those dangling conversations, debrief, and perhaps make plans for next year's event. 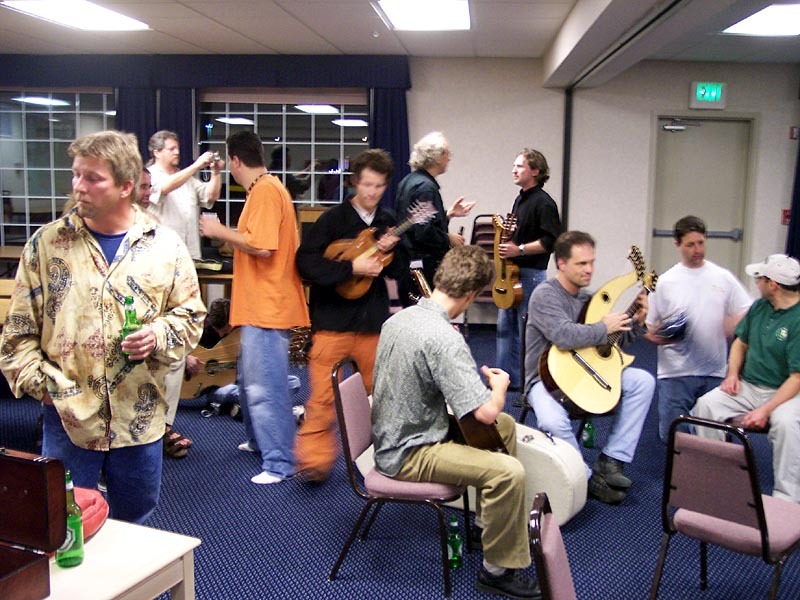 Warning: a dance floor will be cleared for those who still have the energy to boogie! 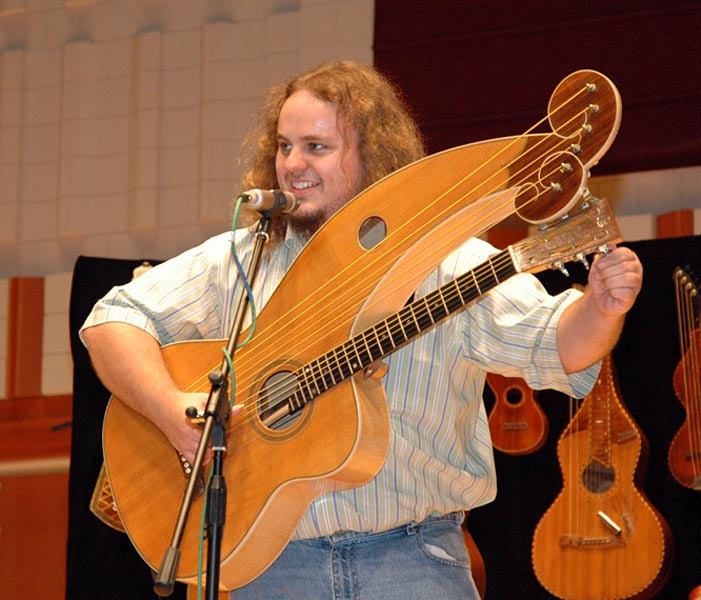 Clearly we've discovered Stacy's secret fantasy: owning more harp guitars and living in surroundings where he can get more in touch with his feminine side. 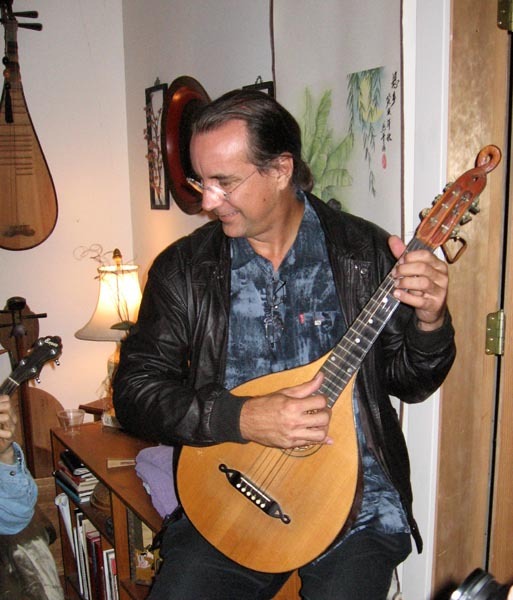 A handy Japanese shamisen allowed Fred and I to create a multi-cultural Dueling Banjos. 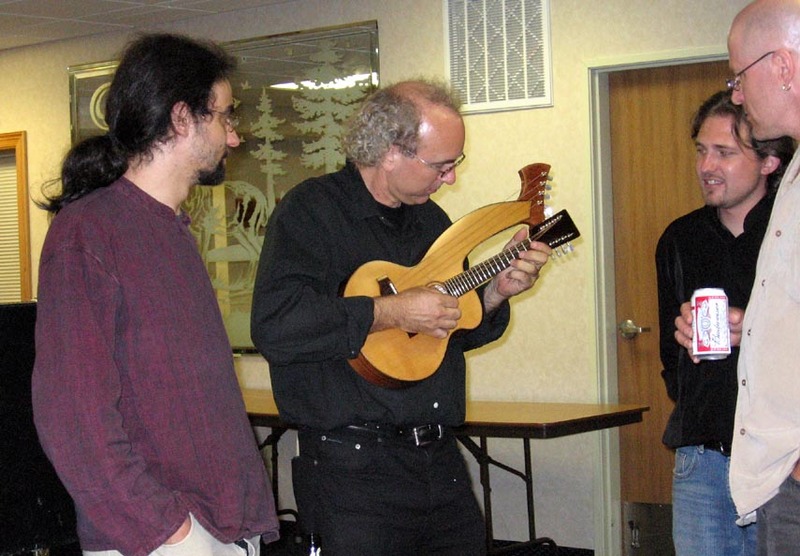 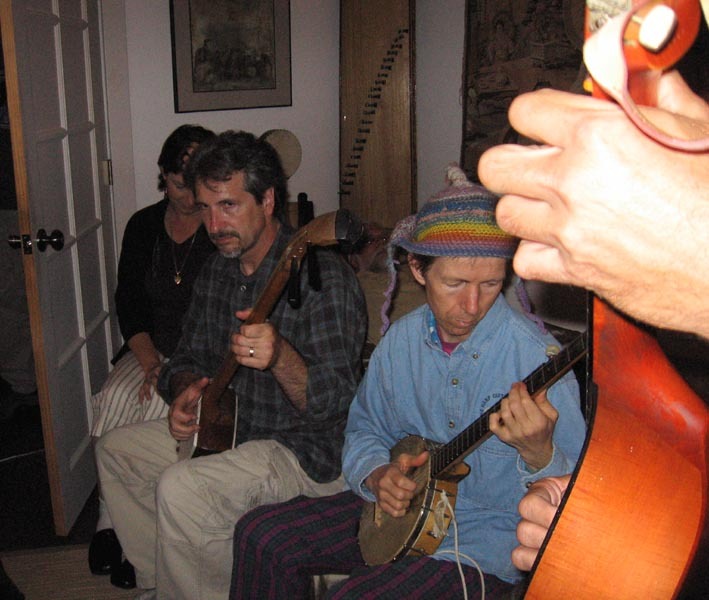 William Eaton joins in on John's new mandolin from Denmark, while John tickles his baby ivories. 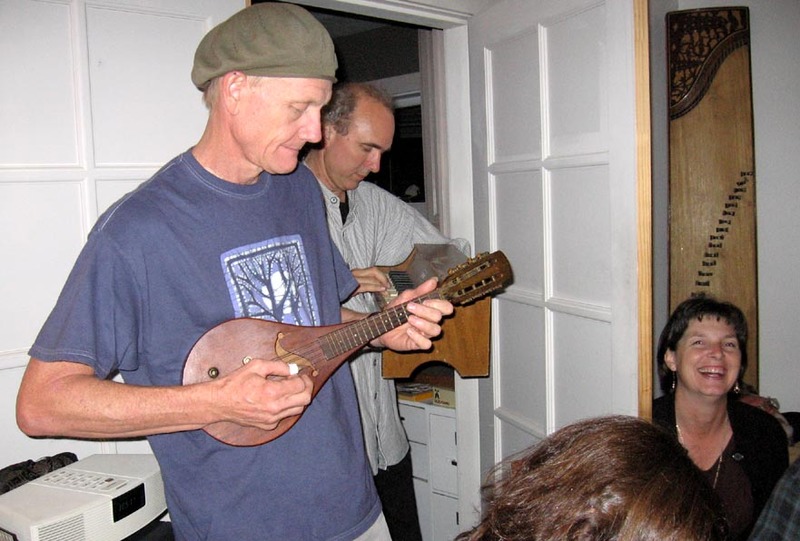 With Andy playing the chords on Swedish lute. 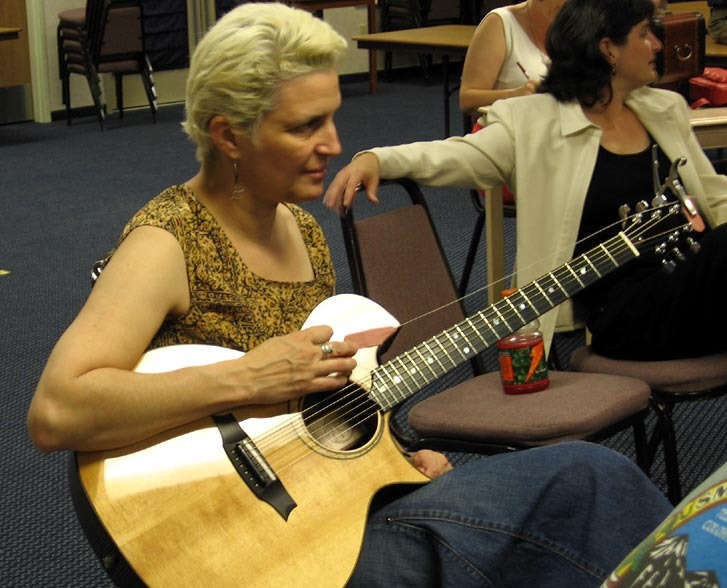 I don't know who my wife Jaci is staring adoringly at, but it's not me! 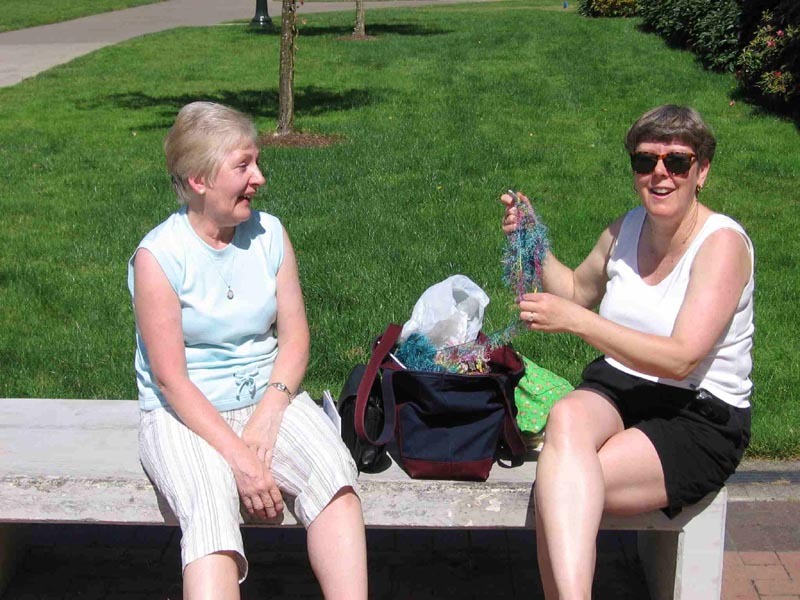 Fred and I were having a blast (honest!) 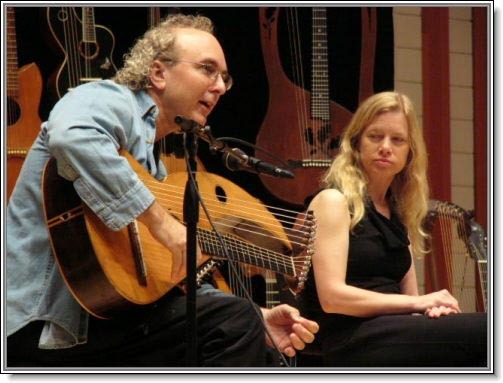 - we were just so exhausted! 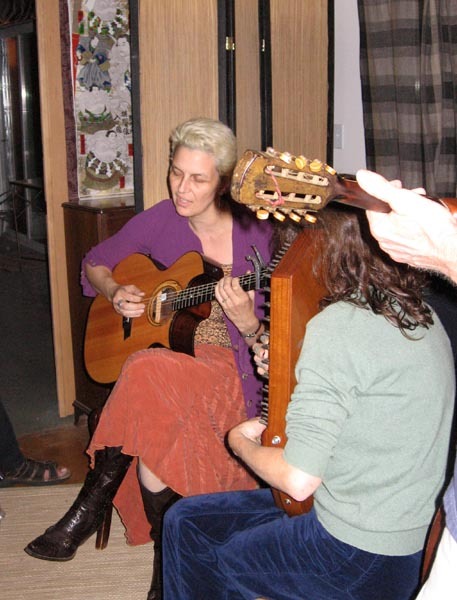 Nancy Conescu and Laura Lind on Autoharp round out the session. 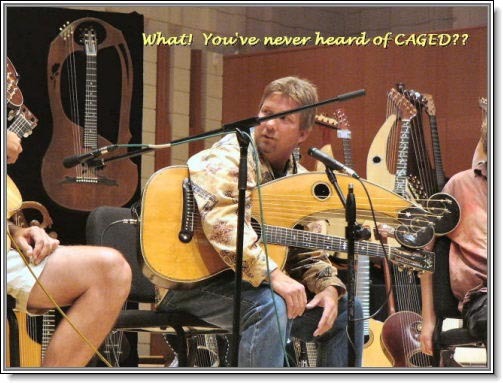 My version of Stacy's "CAGED" system. 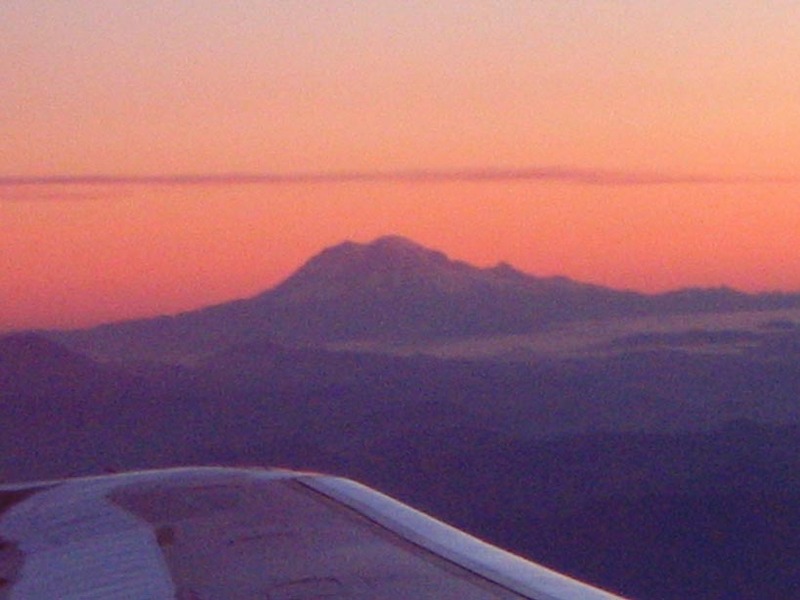 Every sunset is spectacular from the Doan's balcony. 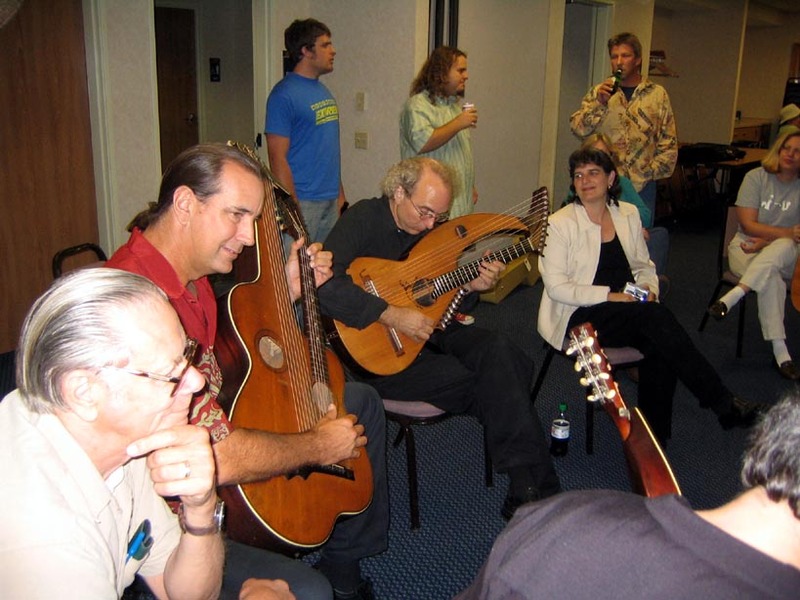 Harp Guitar Historians, Players, and Makers meet informally before traveling home. 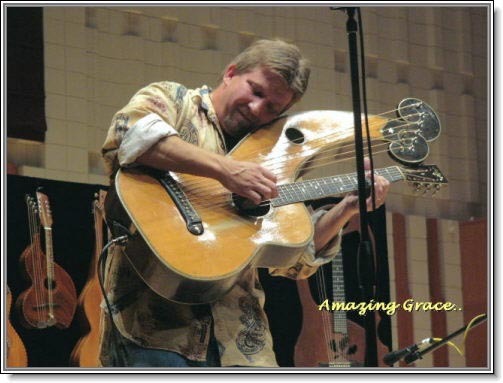 Photos by: Michael Allen, Nate Blaustein, Fred Carlson, Kerry Char, John Detlor, John Doan, Mike Doolin, Frank Doucette, Stacy Hobbs, Brad Hoyt, Gregg Miner, Joe Morgan, Nancy Noe, Gary Pittmon, Bina Titus. 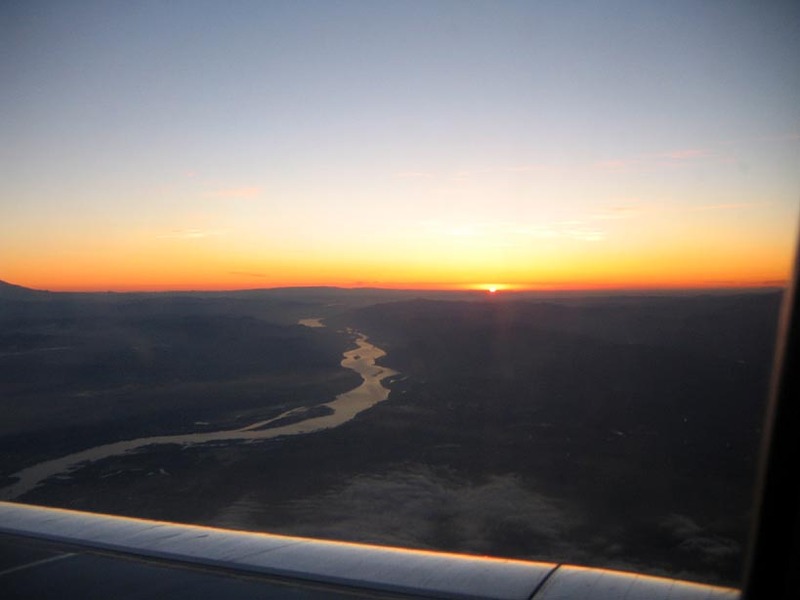 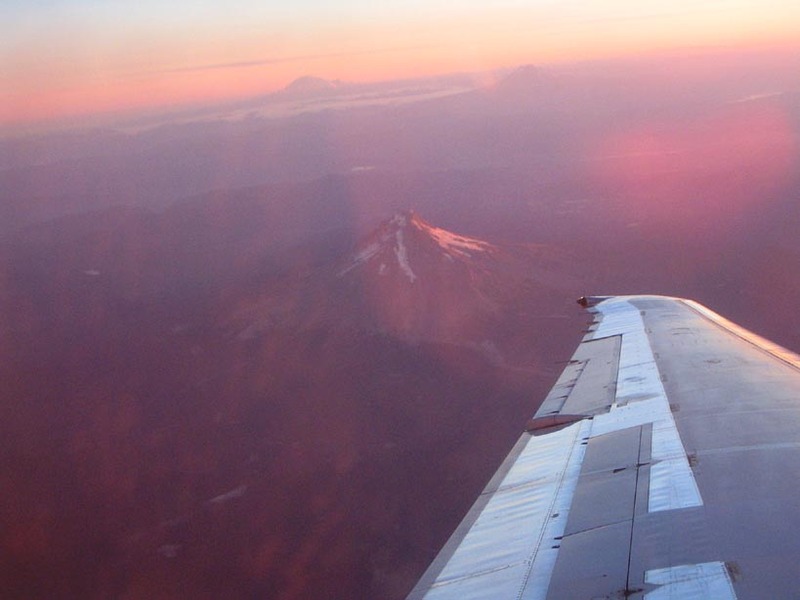 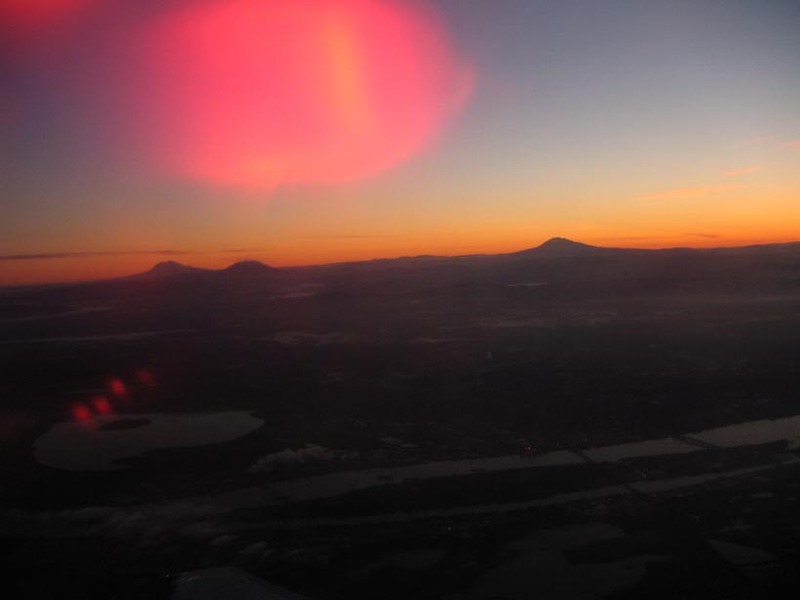 Photo copyright belongs to the original owners. 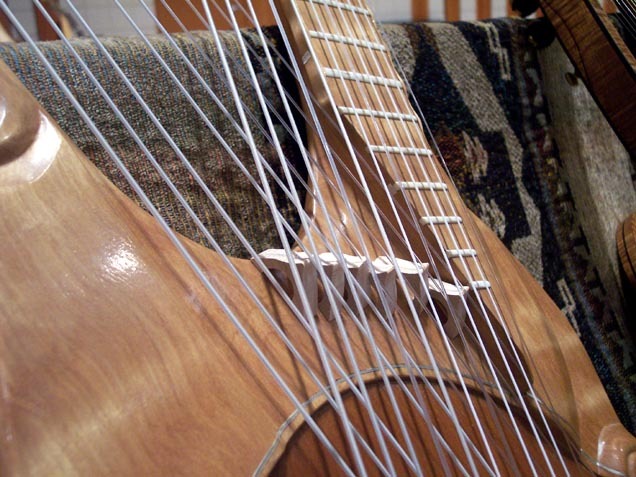 As with all images on Harpguitars.net, the copyright owner's name appears as the end of the file name. 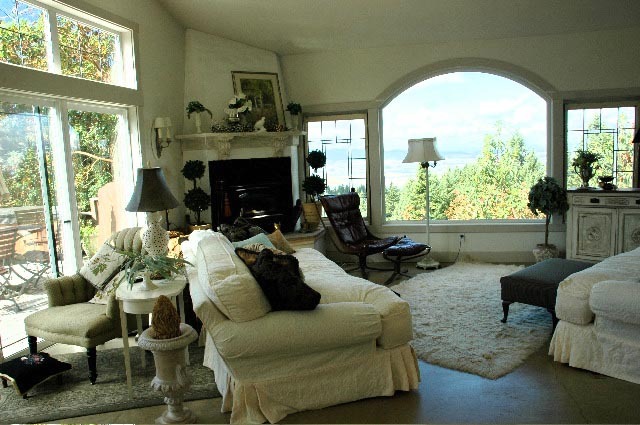 Please contact the individual owners for hi resolution and uncropped copies and use permission.